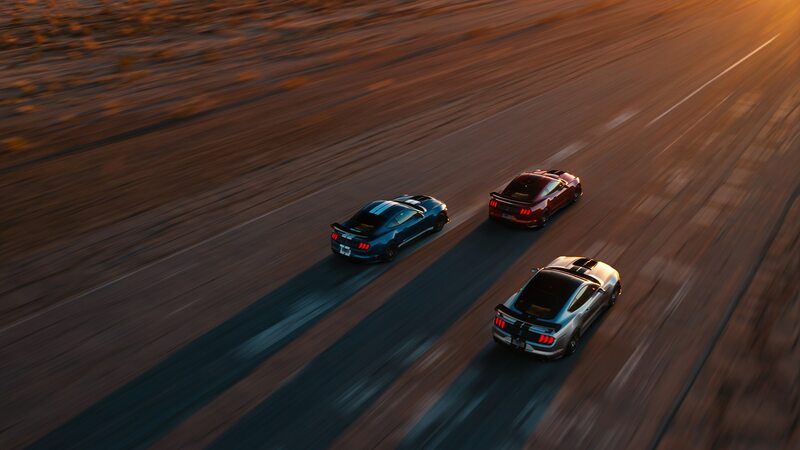 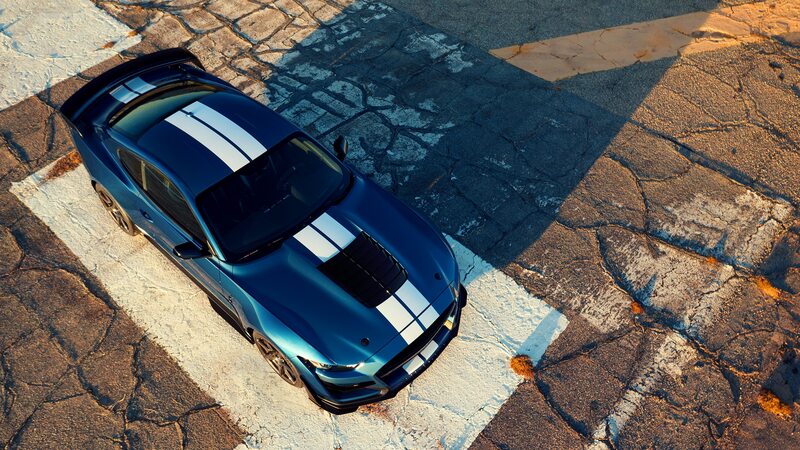 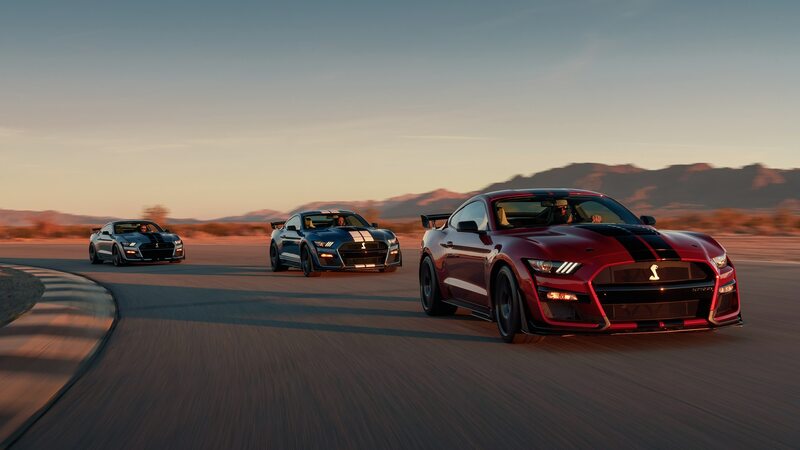 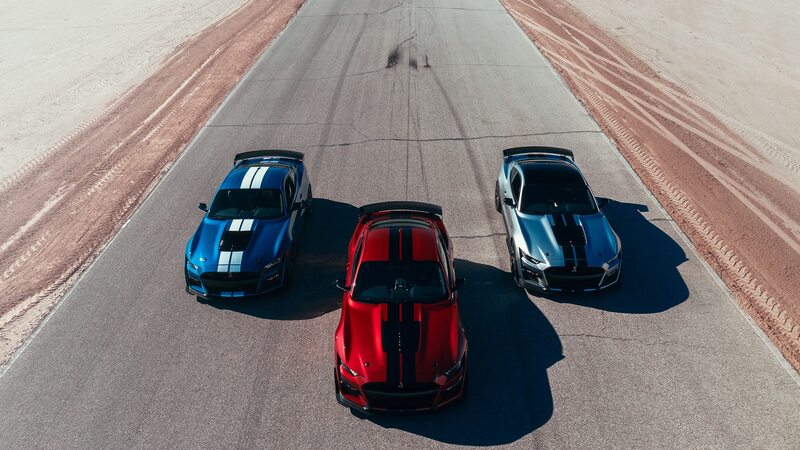 / News / The 2020 Ford Mustang Shelby GT500 Is Here: Run, Camaro, Run! 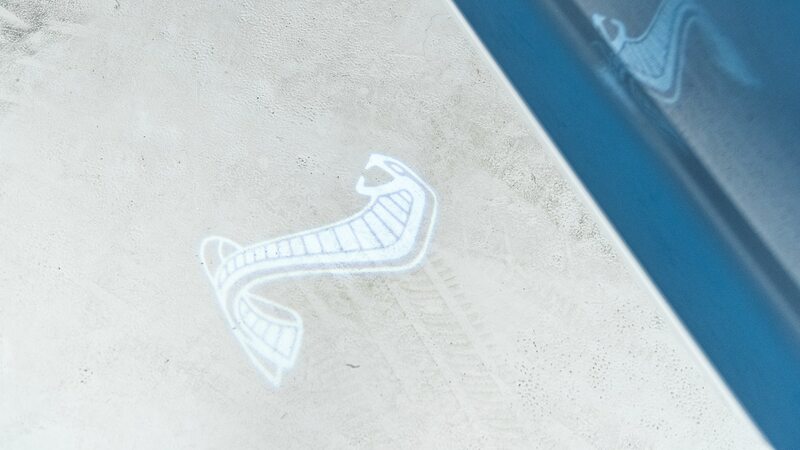 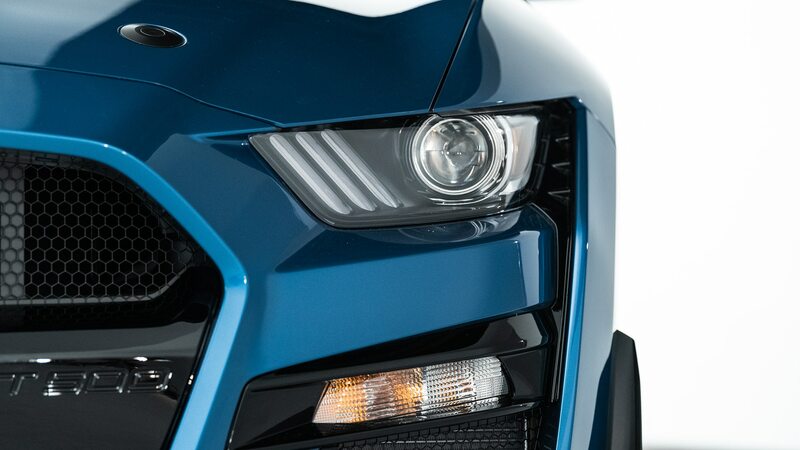 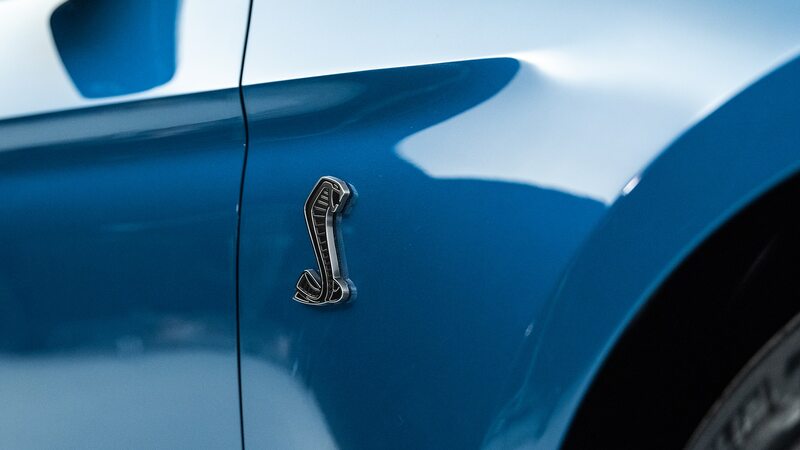 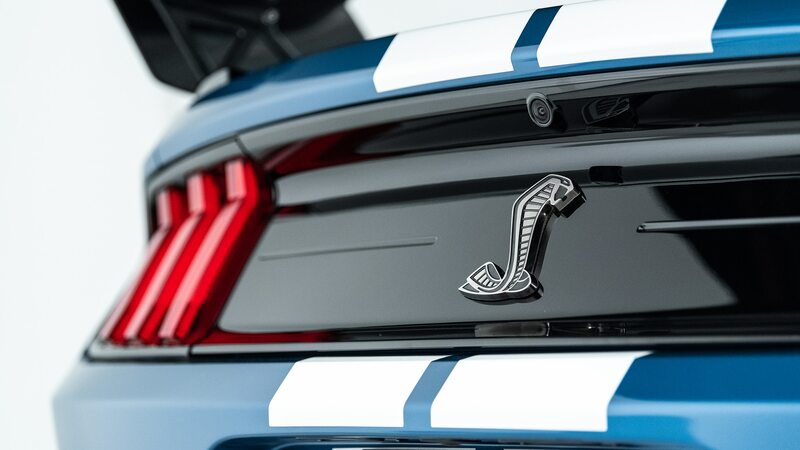 Here, finally, is everything you want to know about the new 2020 Ford Mustang Shelby GT500. 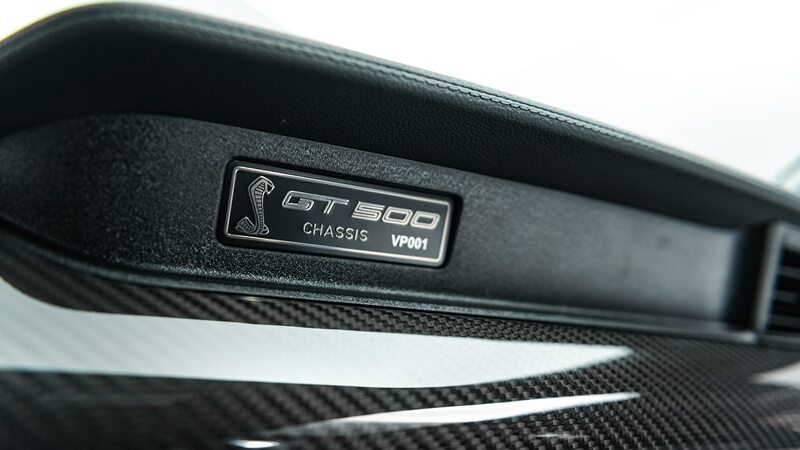 Okay, not exactly everything, because there’s still one important detail even we don’t have yet: the power number generated by the car’s supercharged 5.2-liter V-8. 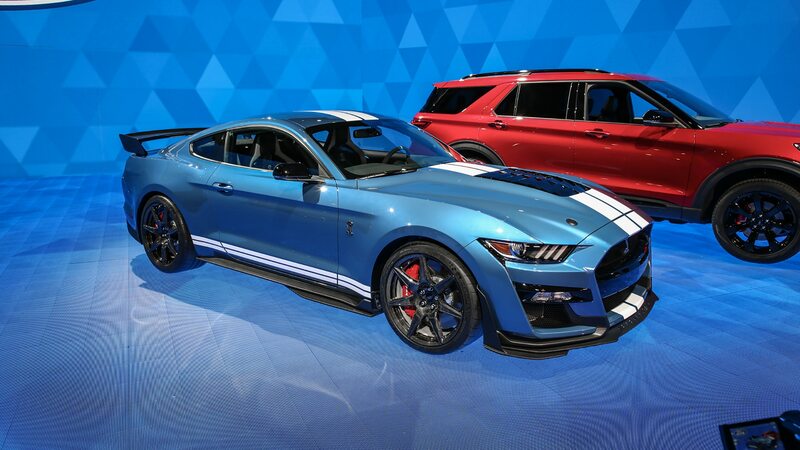 Ford says it won’t finalize the figure until the fall, once it’s wrung every single ounce of potential from the powertrain. 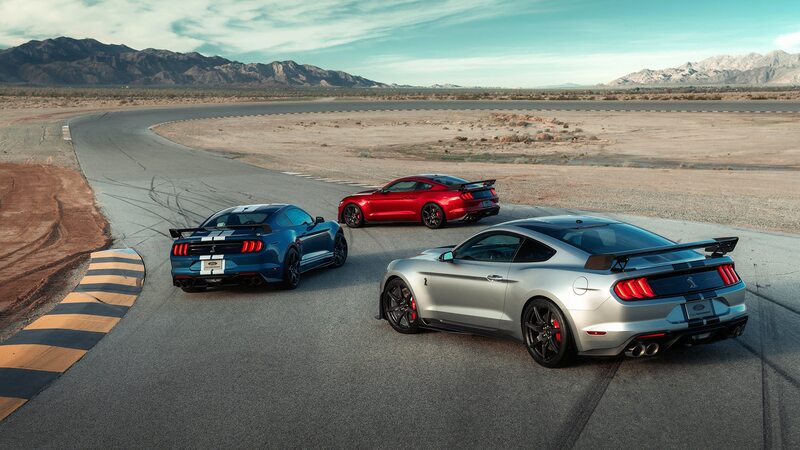 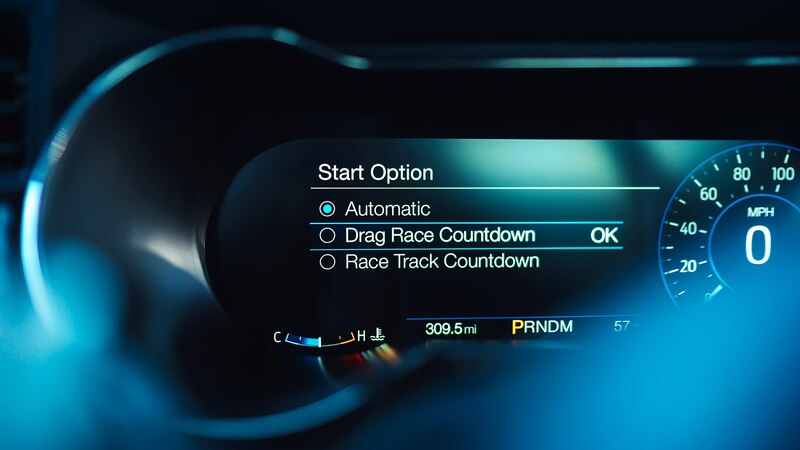 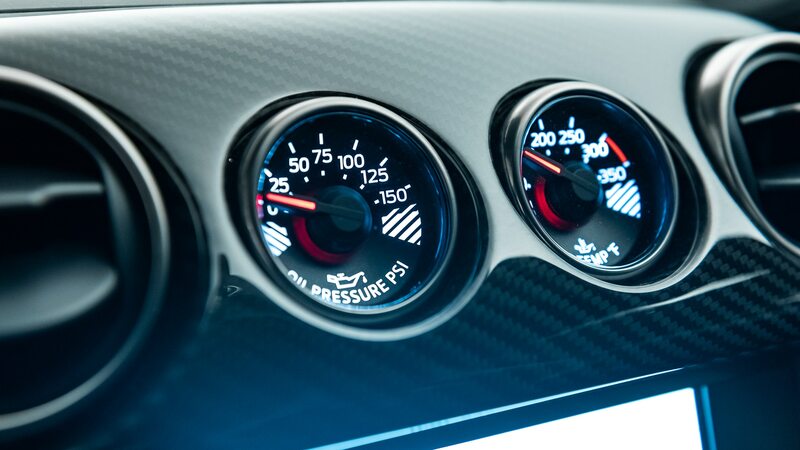 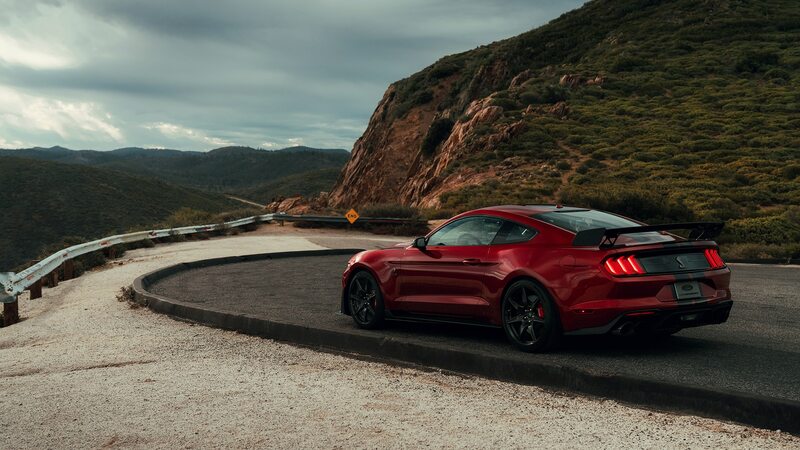 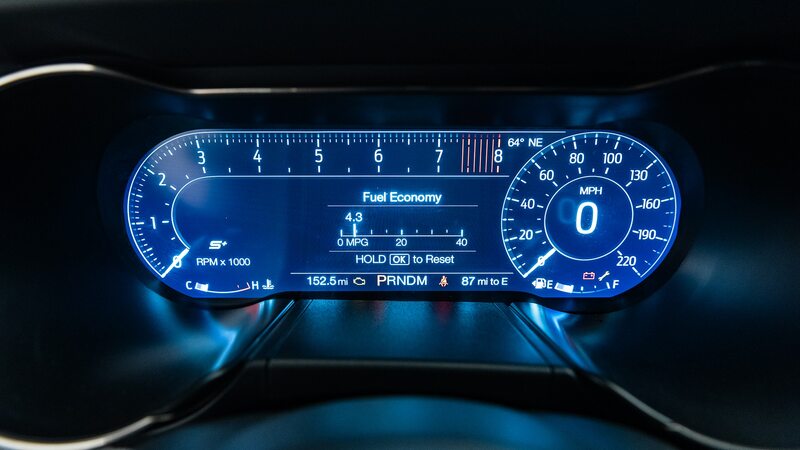 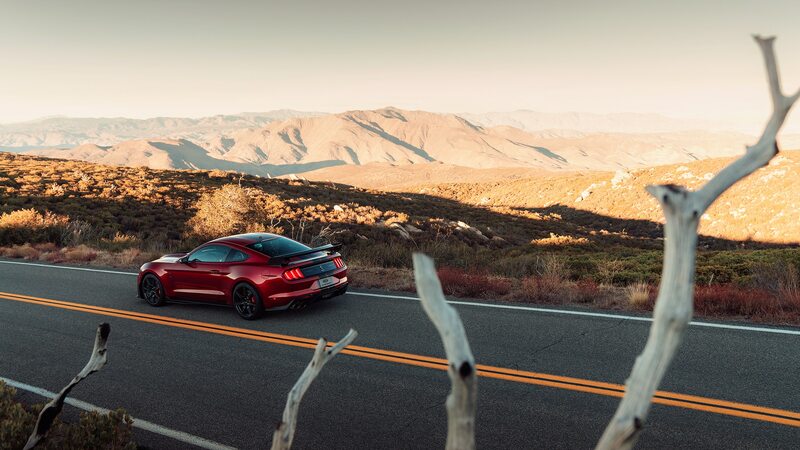 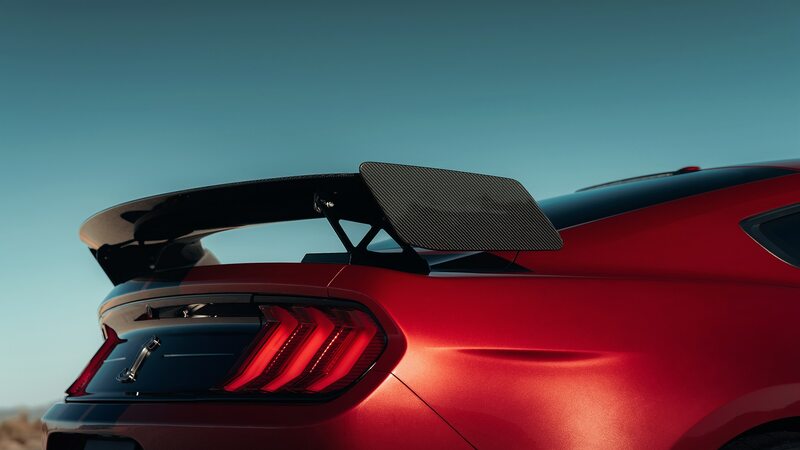 For now, the company and Mustang chief engineer Carl Widmann are sticking to saying it’ll make “more than 700 horsepower.” Likewise, specific performance numbers aren’t yet public, but we were told to expect a sub-11-second quarter-mile and a zero-to-60-mph time in the mid-threes. 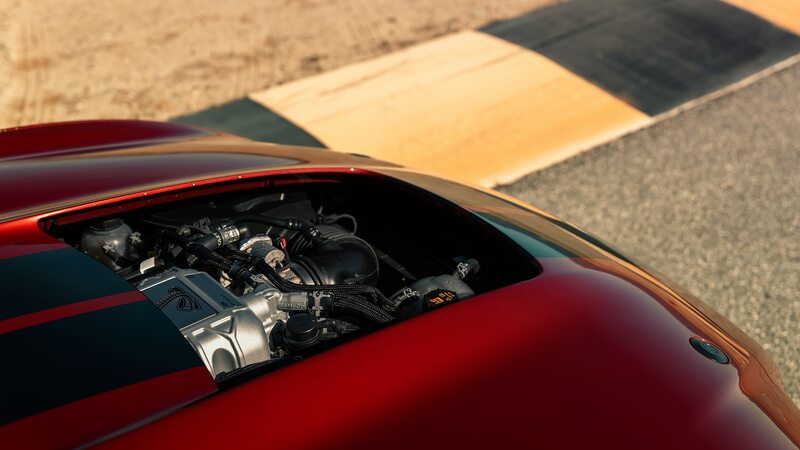 About that engine. 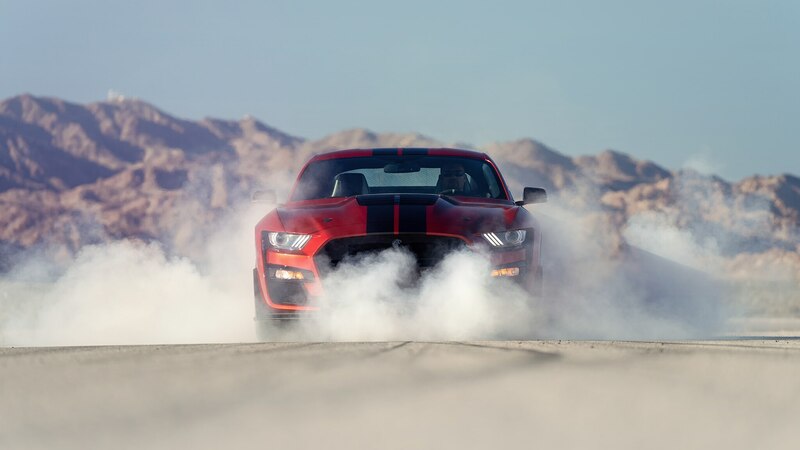 The new GT500 gets a version of the port-injected 5.2 in the Shelby GT350, but it’s topped by a 2.7-liter blower tucked low between the cylinder banks to maintain as much forward visibility as possible. 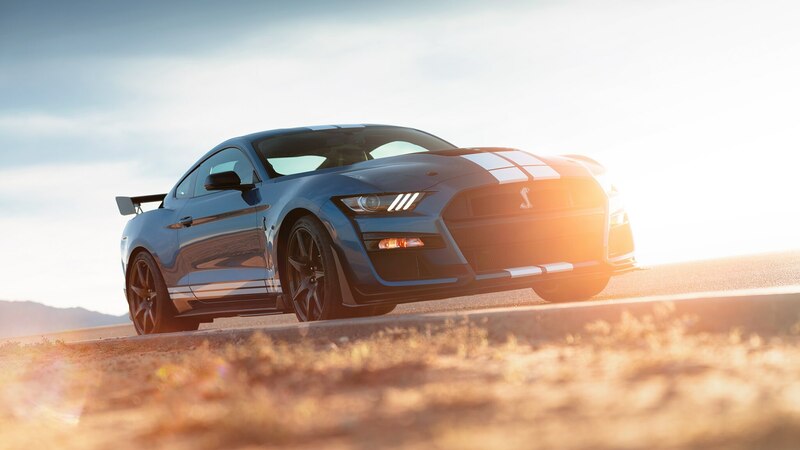 The block has been reinforced with more ribbing and longer head bolts to handle the additional power—the GT350 has 526 horses—and also features new valve seats and seals and stronger valve springs, as well as a baffled structural oil pan. 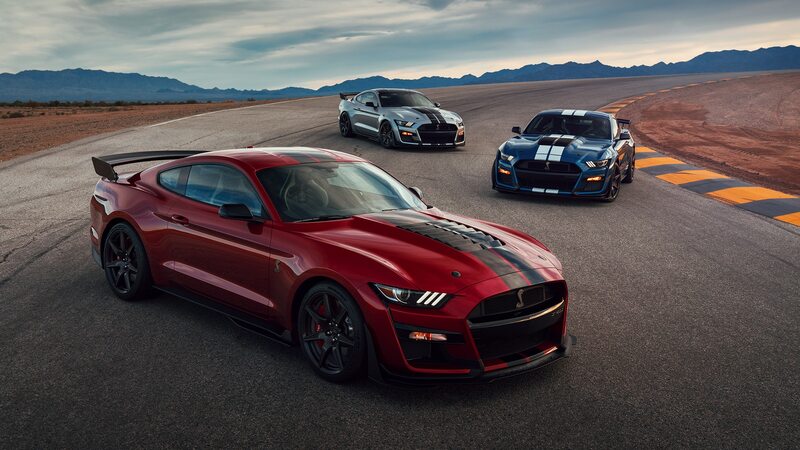 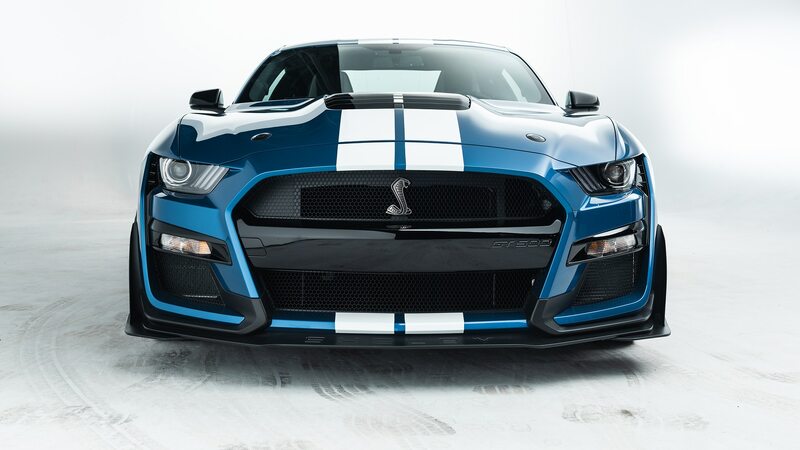 The GT350’s flat-plane crankshaft has been swapped for a cross-plane one in the interest of having it not explode. 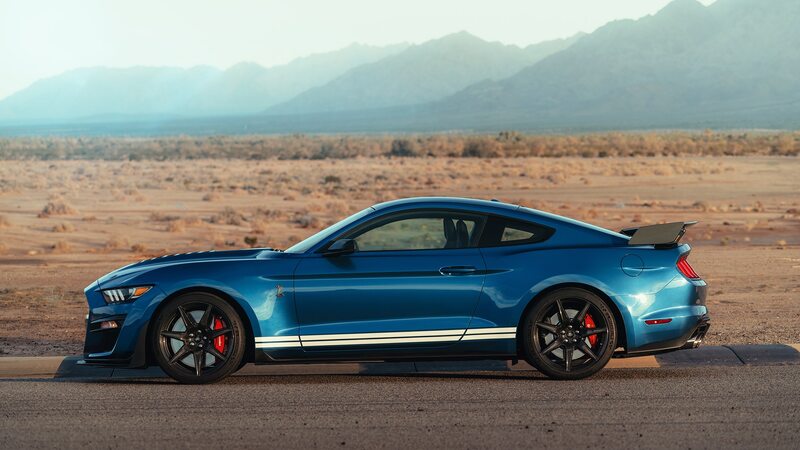 We also don’t yet know the torque output, but Widmann says it will be “significantly more than the GT350,” which stumps up 429 lb-ft of the stuff. 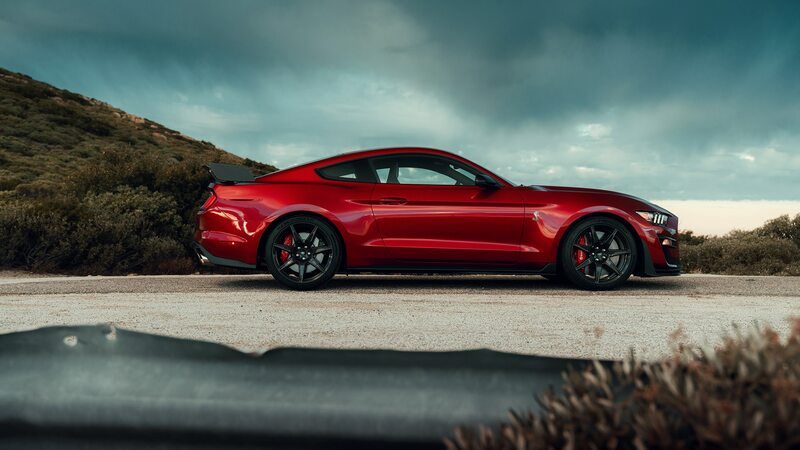 Whatever the ultimate number, it was enough to necessitate a shift to a stouter Tremec-sourced seven-speed dual-clutch automatic in place of the 10-speed unit offered in most every other Mustang. 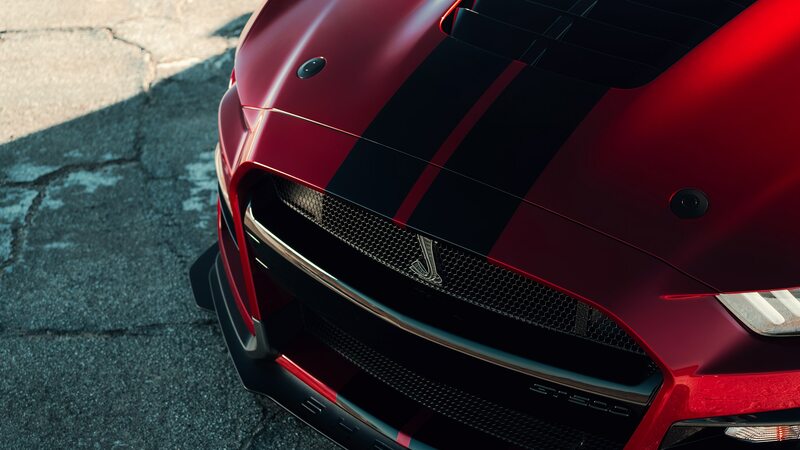 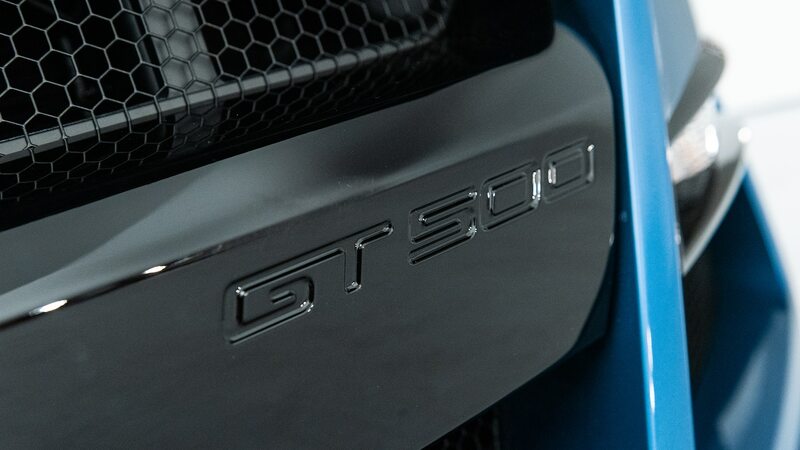 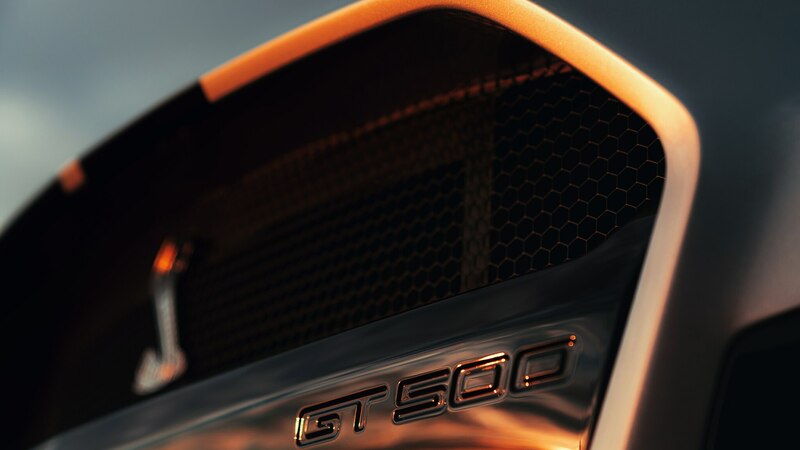 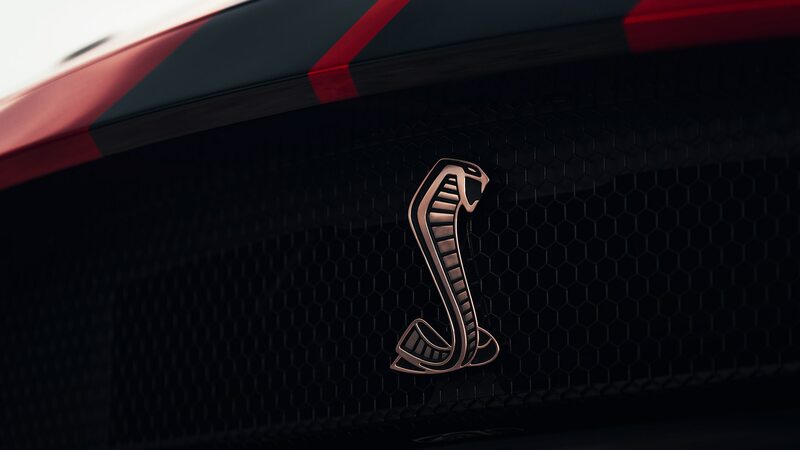 There will be no manual option for the GT500, sadly. 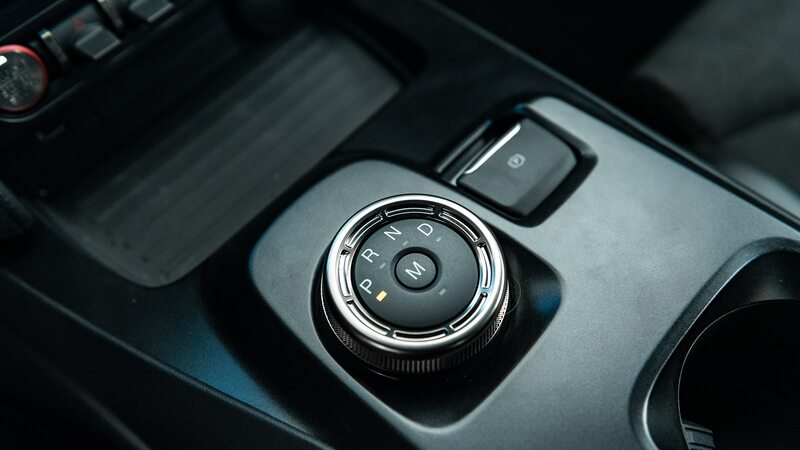 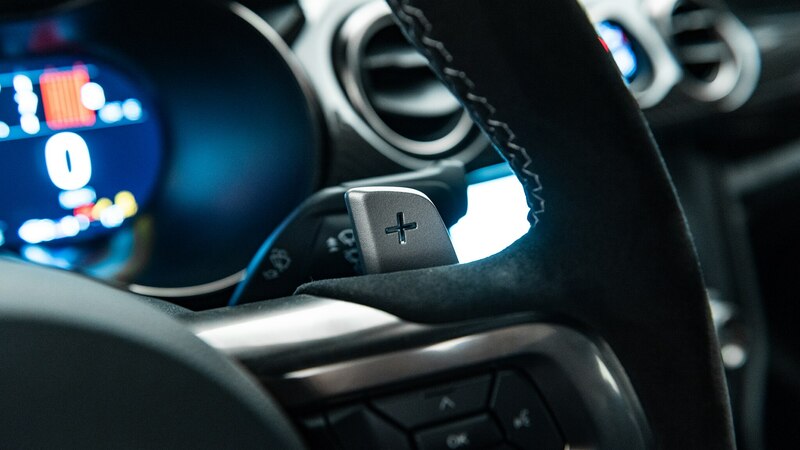 The new transmission weighs roughly the same as the 10-speed unit and features three overdrives, with fourth gear being roughly 1.1:1, and features Normal, Weather, Sport, Drag, and Track modes. 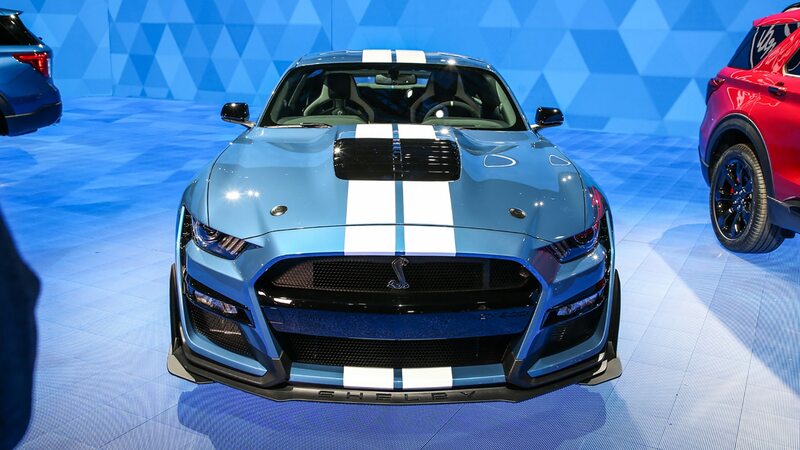 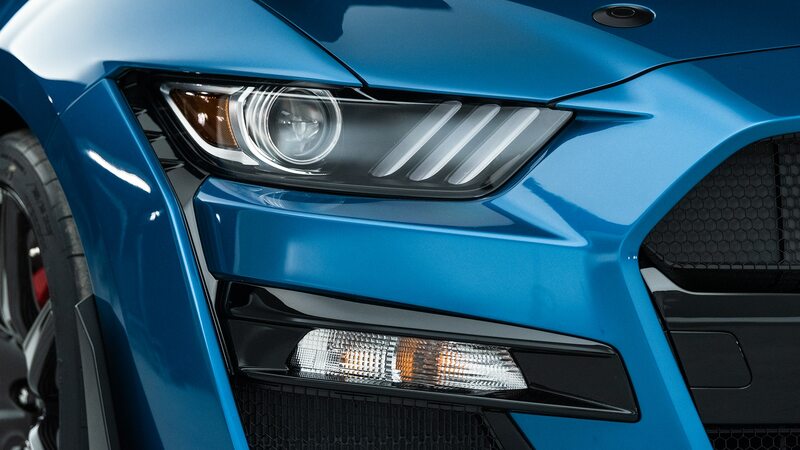 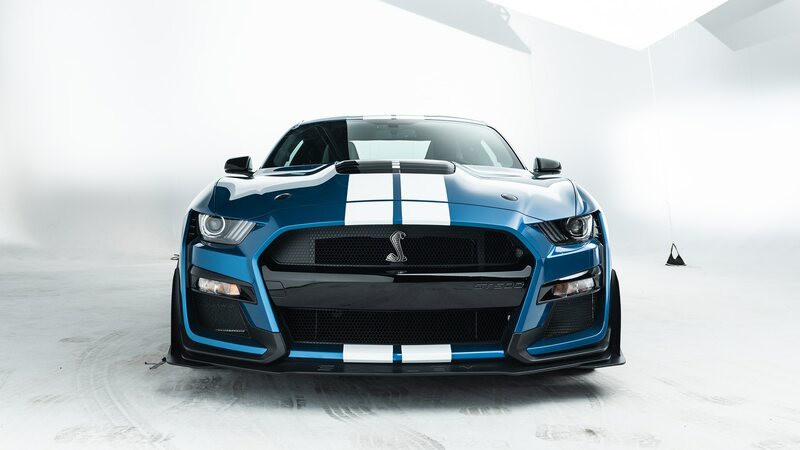 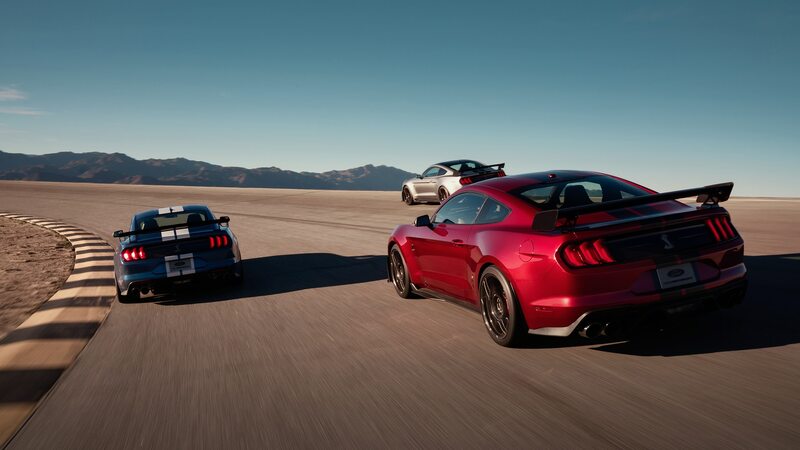 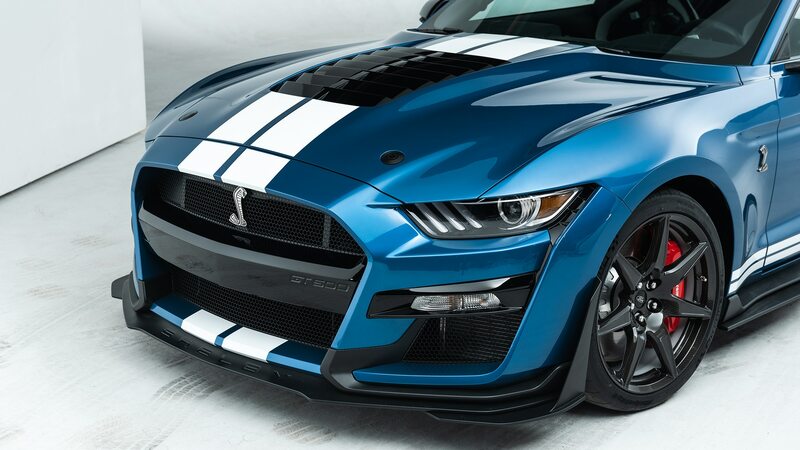 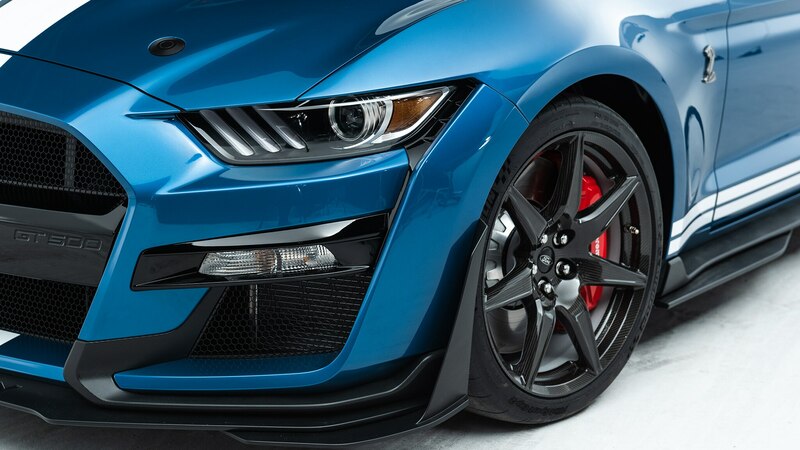 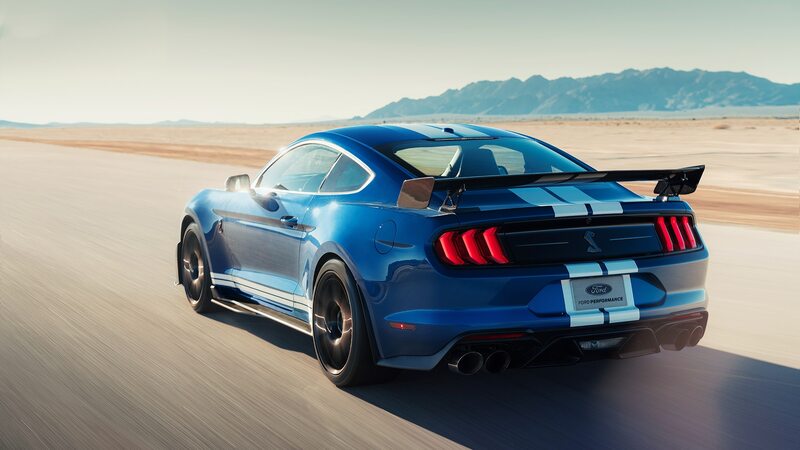 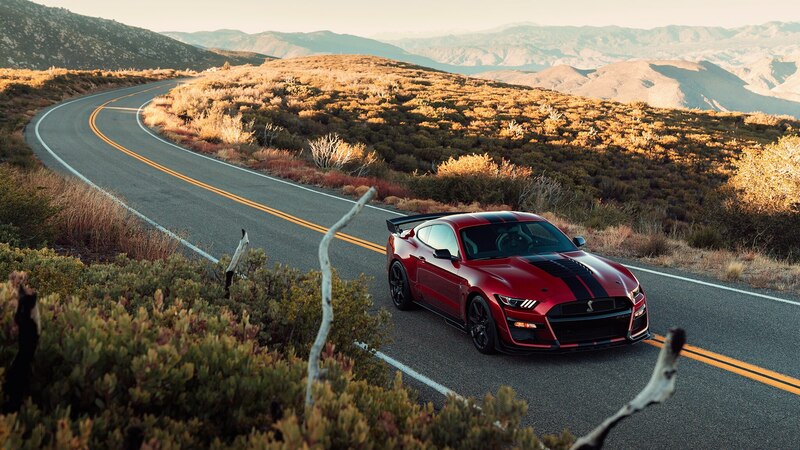 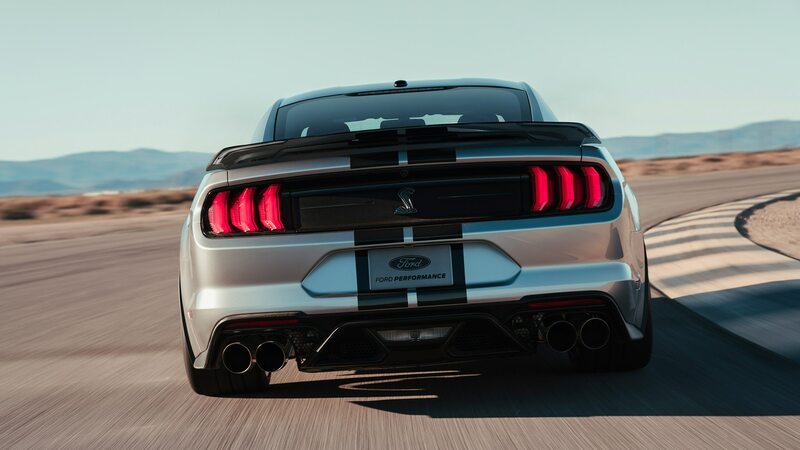 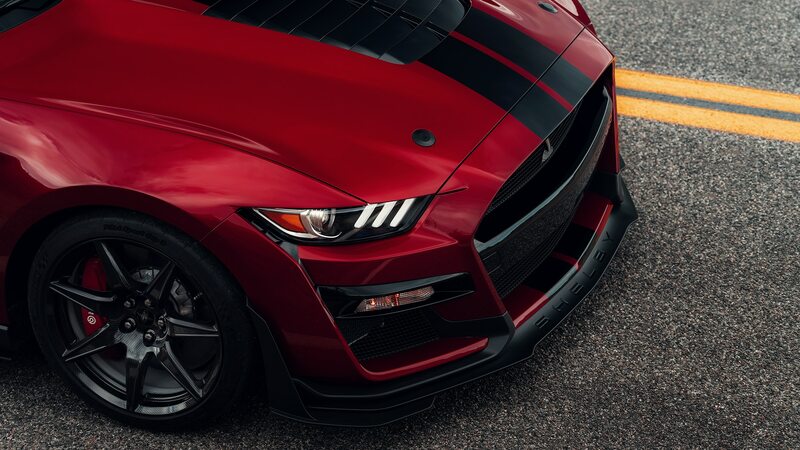 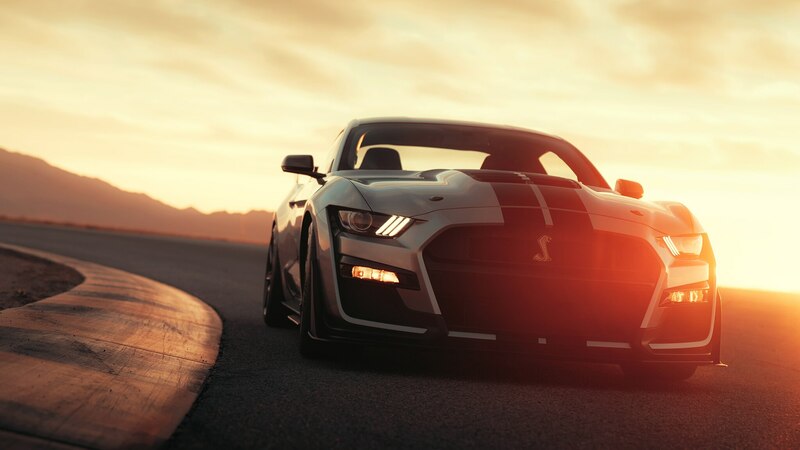 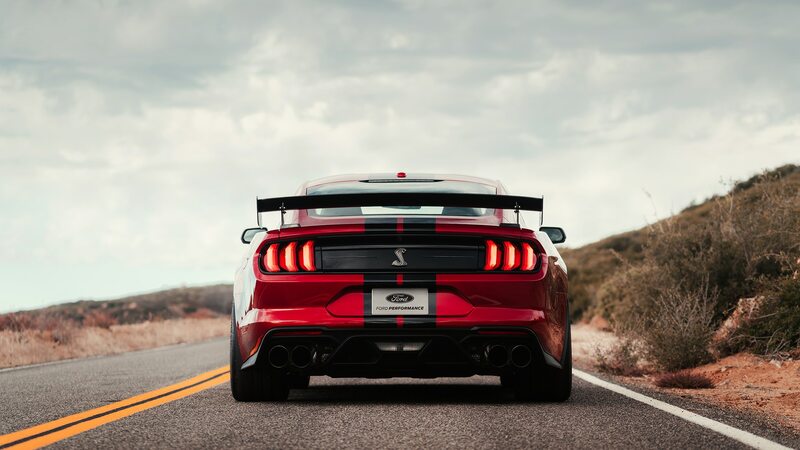 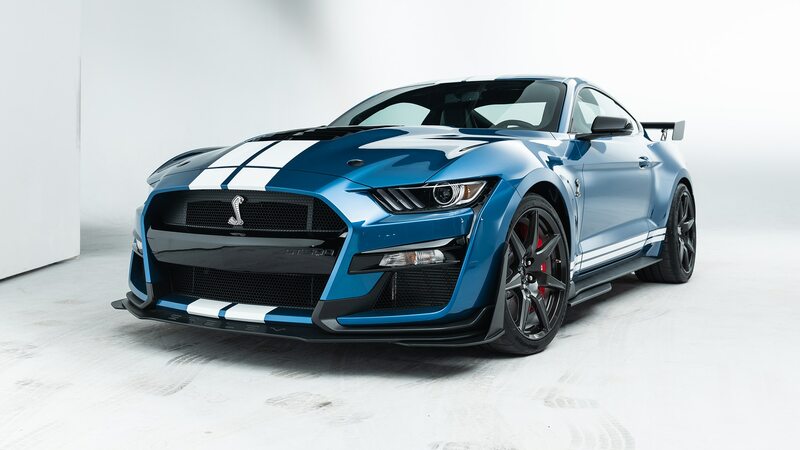 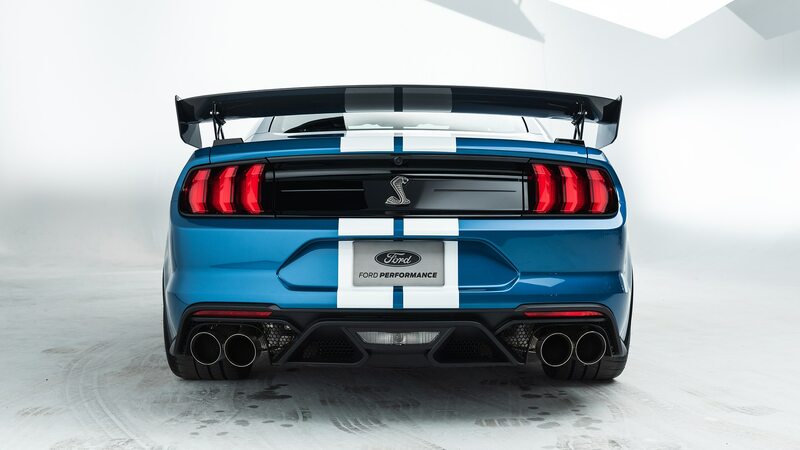 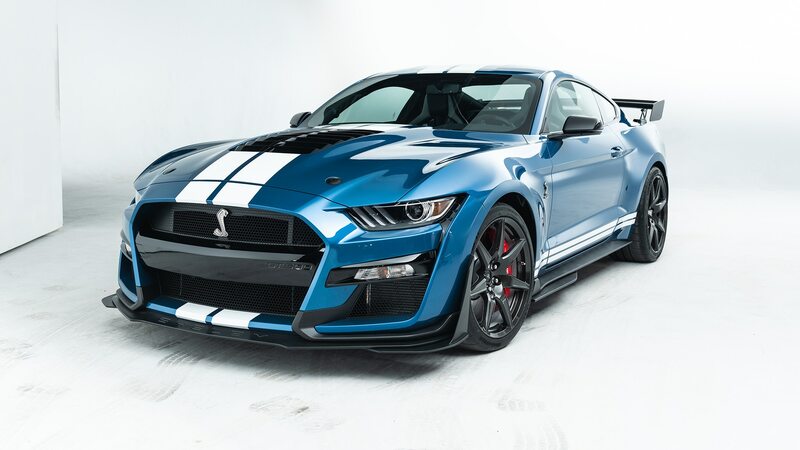 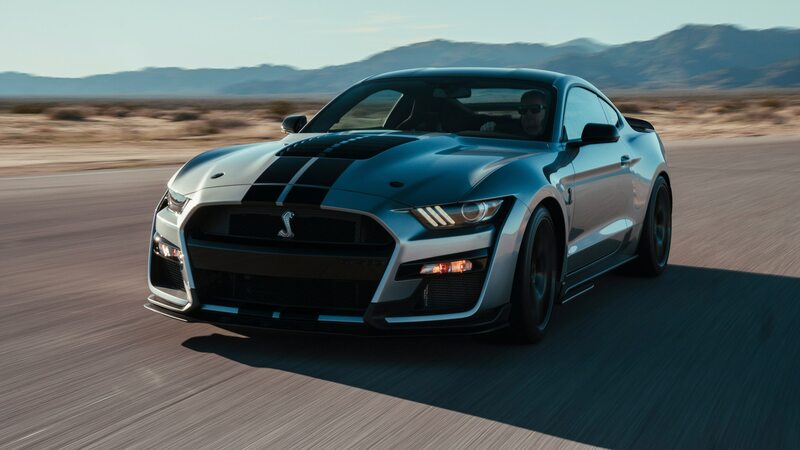 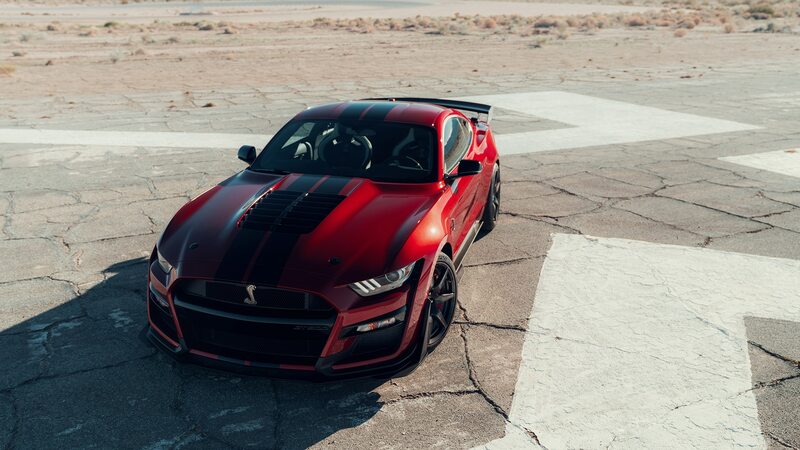 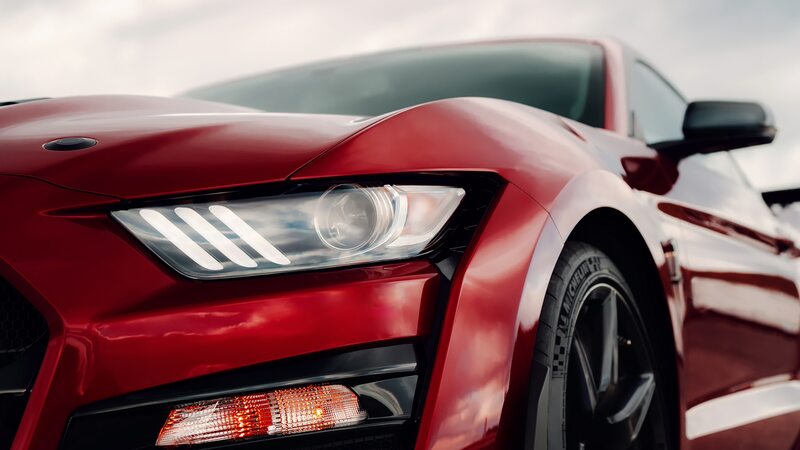 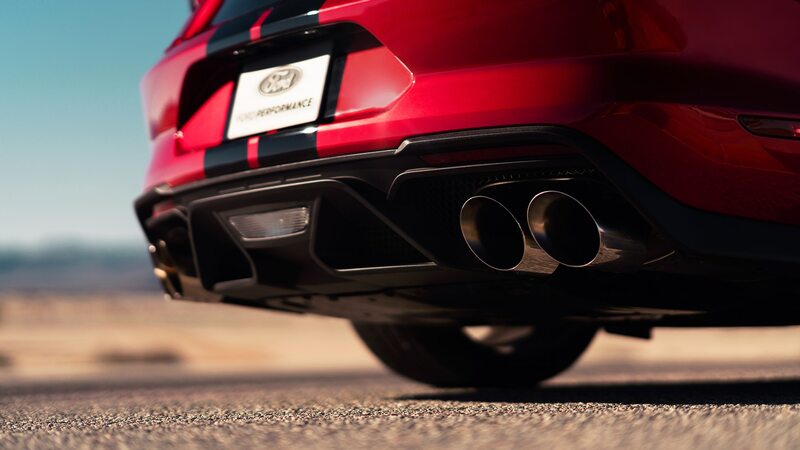 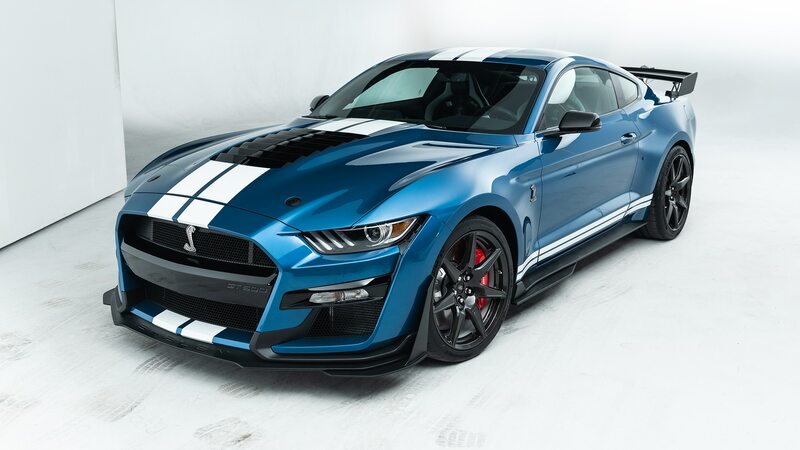 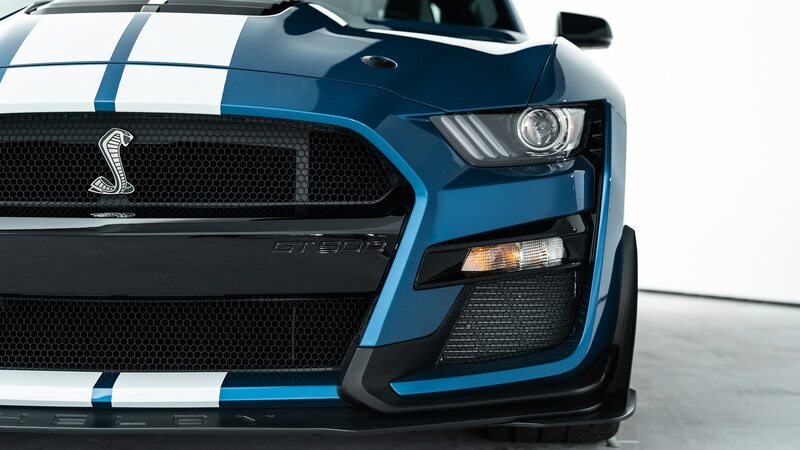 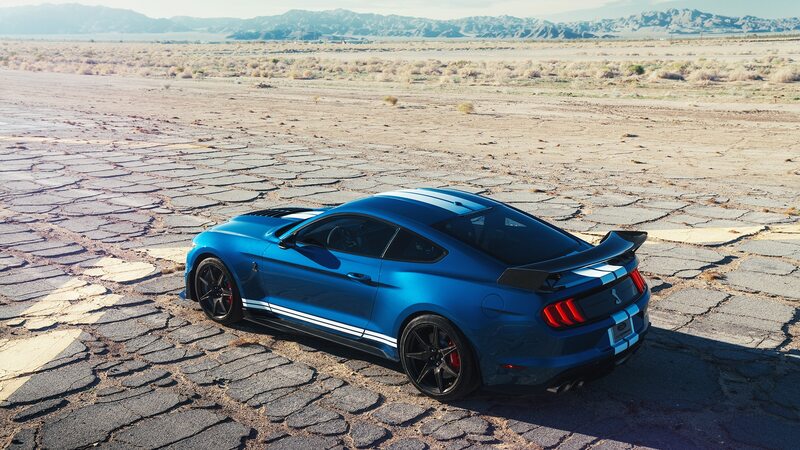 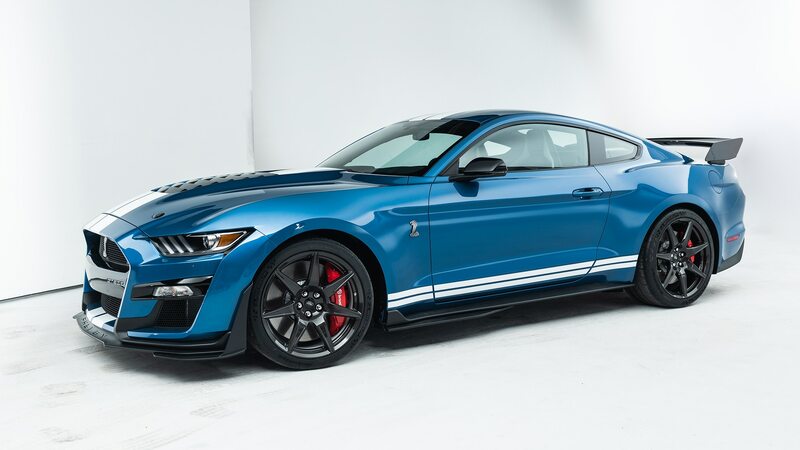 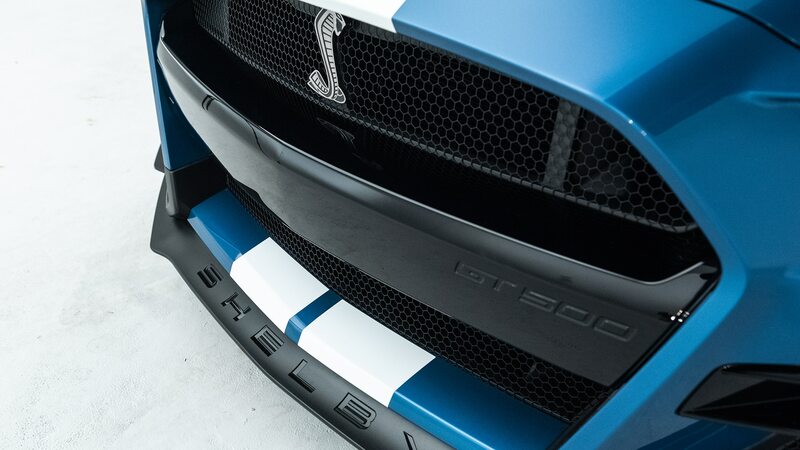 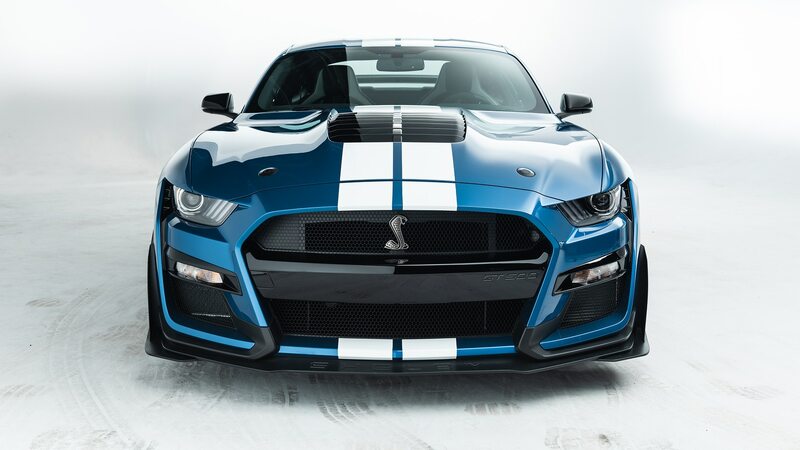 It routes the V-8’s fusillade to the rear wheels via a unique carbon-fiber driveshaft and bulkier half-shafts than those of the GT350. 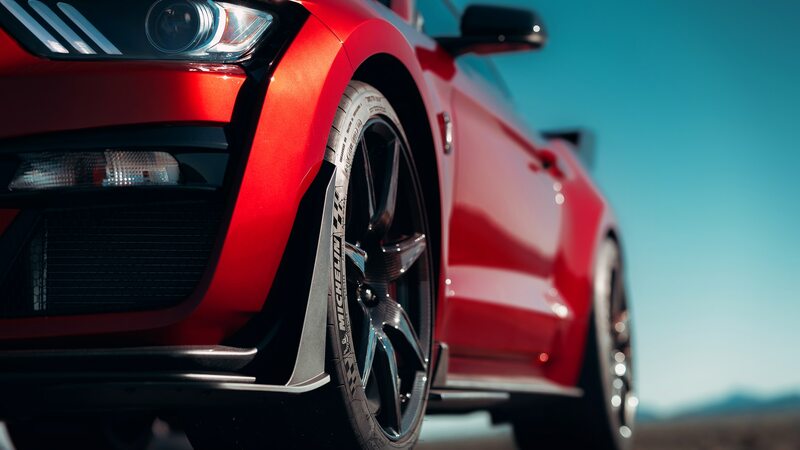 The car’s Torsen mechanical limited-slip differential features a 3.73 ratio, while line-lock and launch control programs are standard. 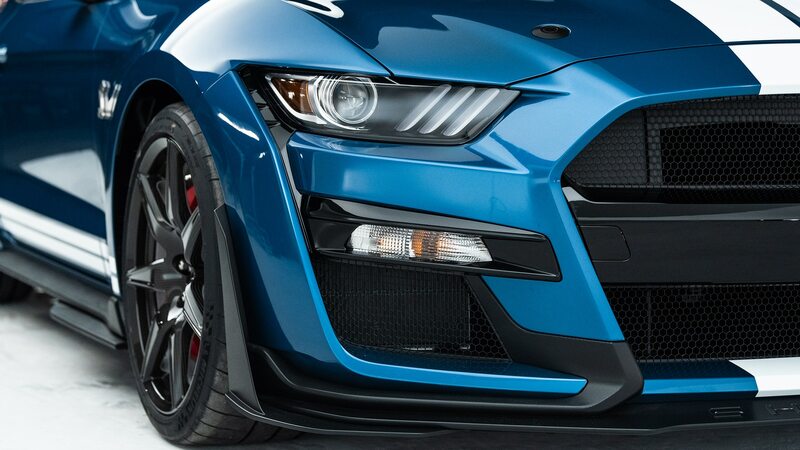 The dual-clutch ’box allowed for a switch to a smaller transmission heat exchanger, which is good because the front end is positively stuffed with radiators; in fact, the GT500 has double the open area of the GT350 to ensure they all get air. 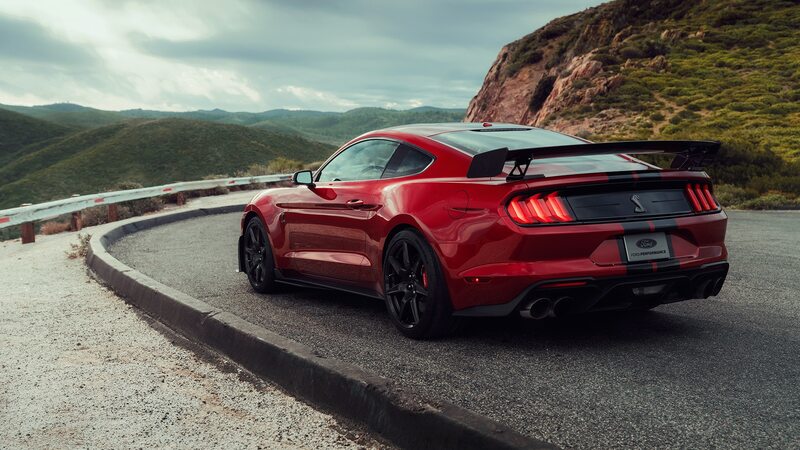 The first, cleanest air goes to the supercharger, with the main radiator being mounted behind that and the transmission cooler below; an oil cooler and an auxiliary radiator can be found tucked into the outboard intakes. 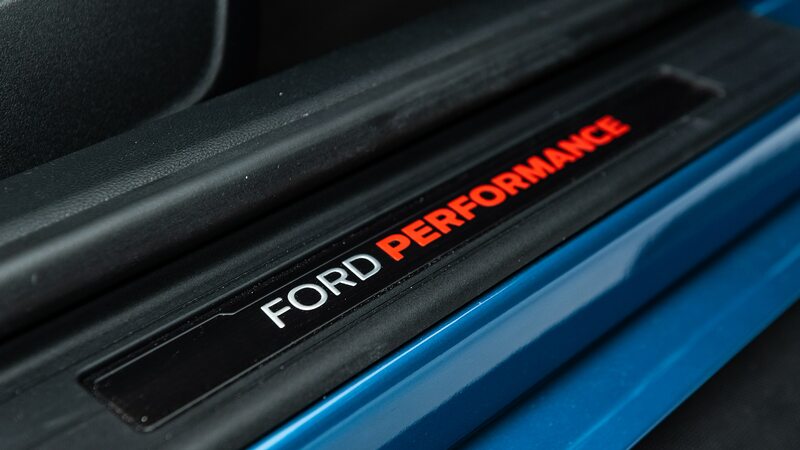 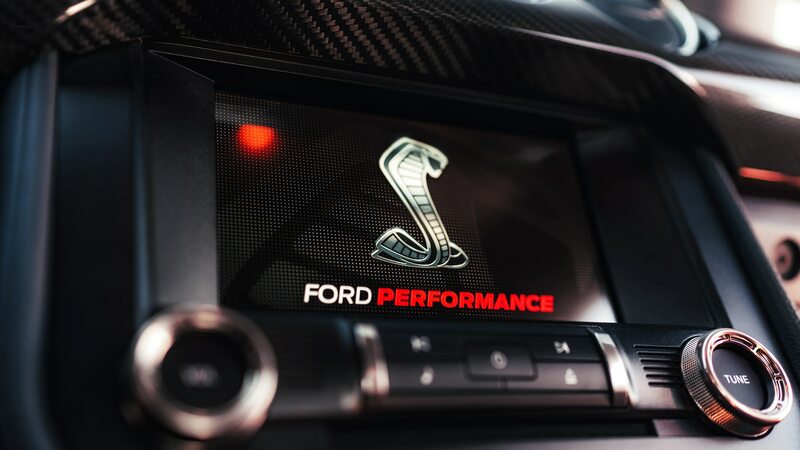 In the engine bay, there’s a latticed magnesium strut-tower brace that looks like a hand-to-hand combat weapon, and so much air enters through the front end that the hood features the largest hole ever punched through one for a Ford product. 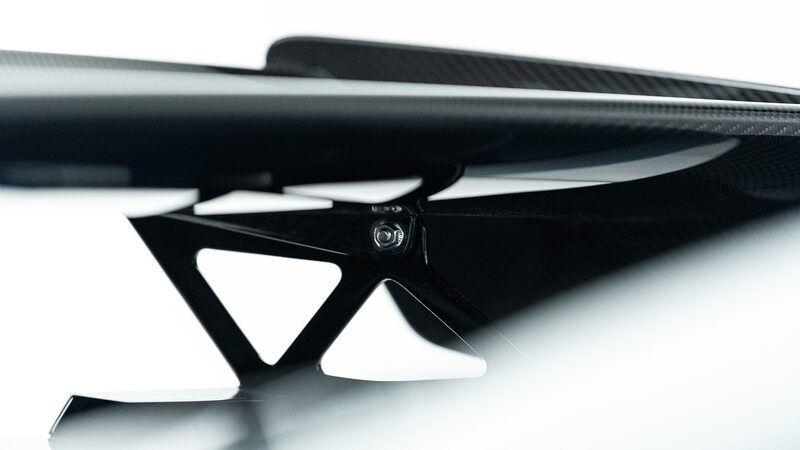 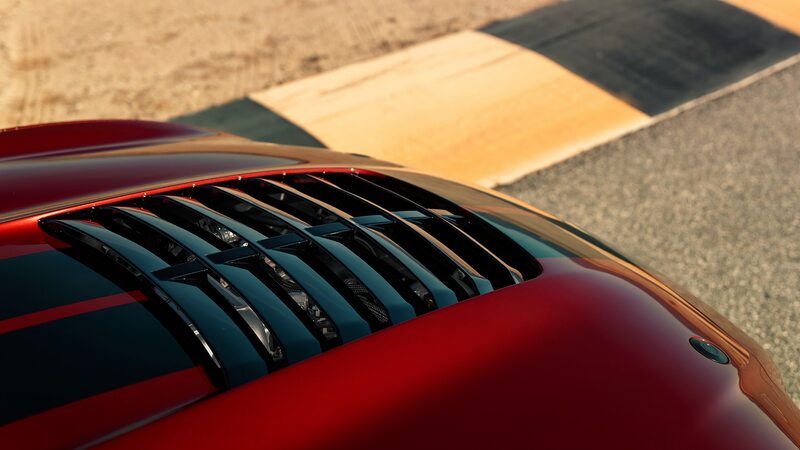 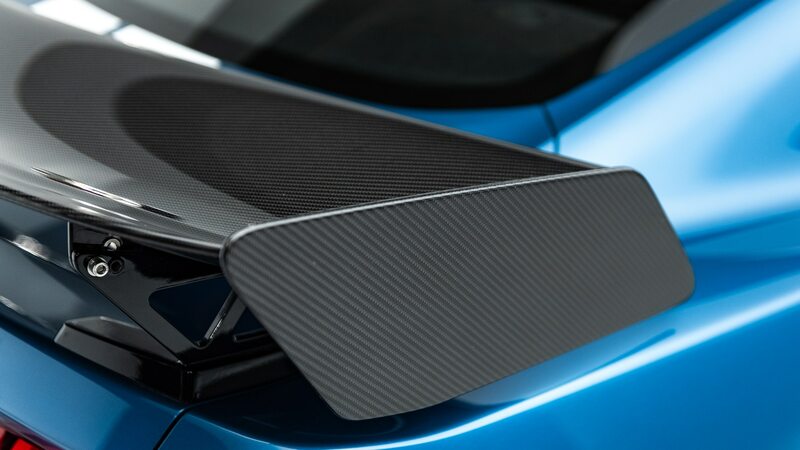 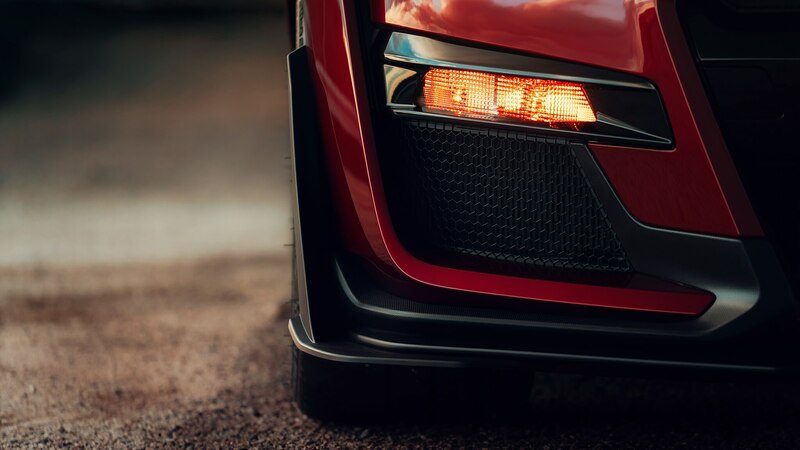 Its louvered carbon-fiber vent massively reduces front-end lift when the rain tray is removed—this is a highly advisable action if you hit a track—but even so the panel needs to be held down not only with a traditional latch but also a pair of hood pins. 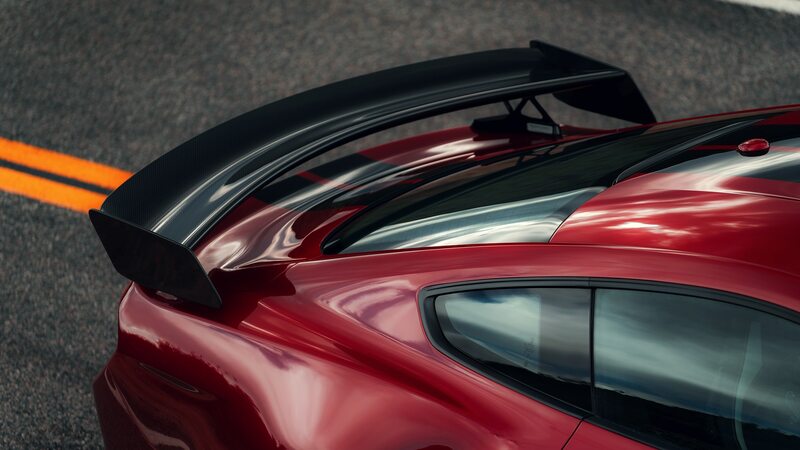 We were told the car’s panels are all new from the A-pillar forward, which is fairly obvious. 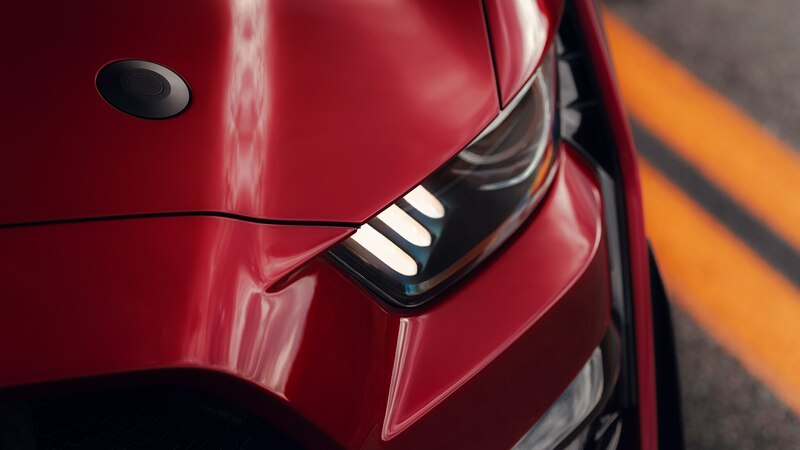 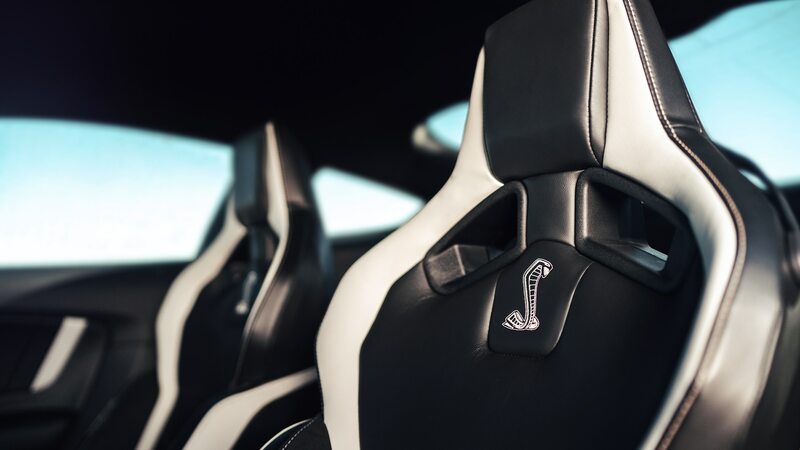 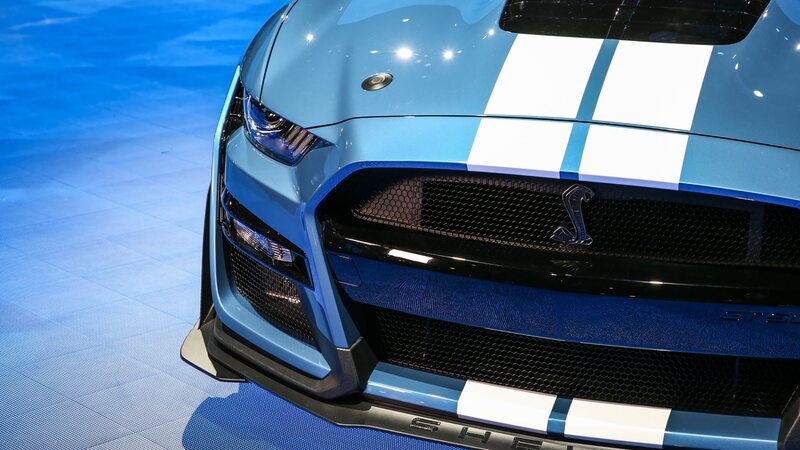 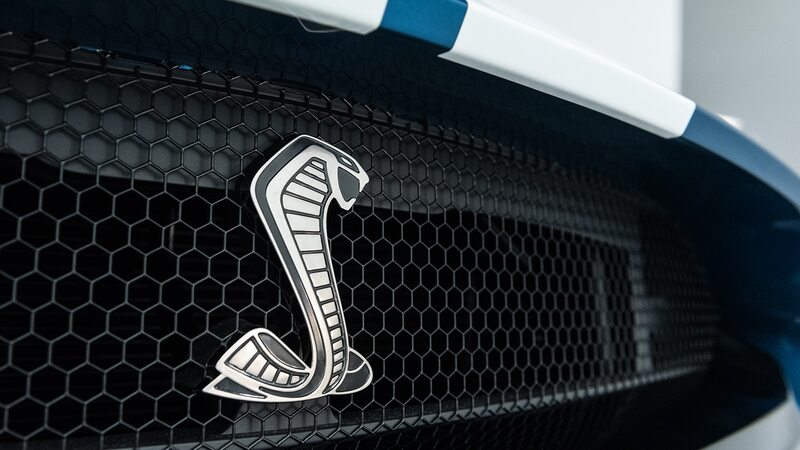 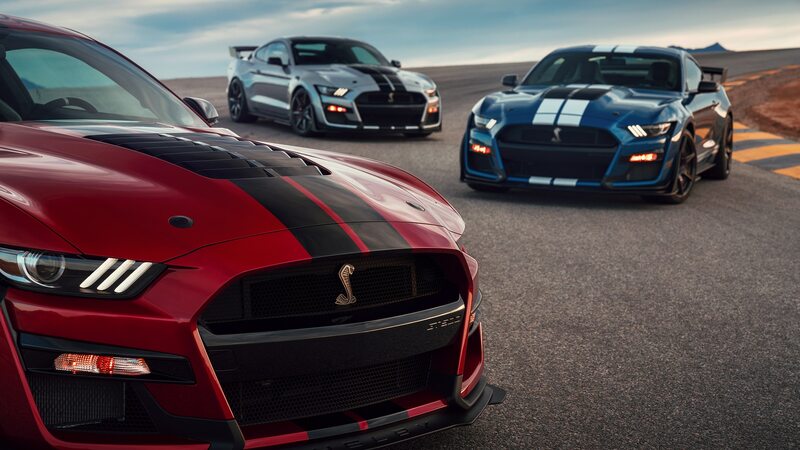 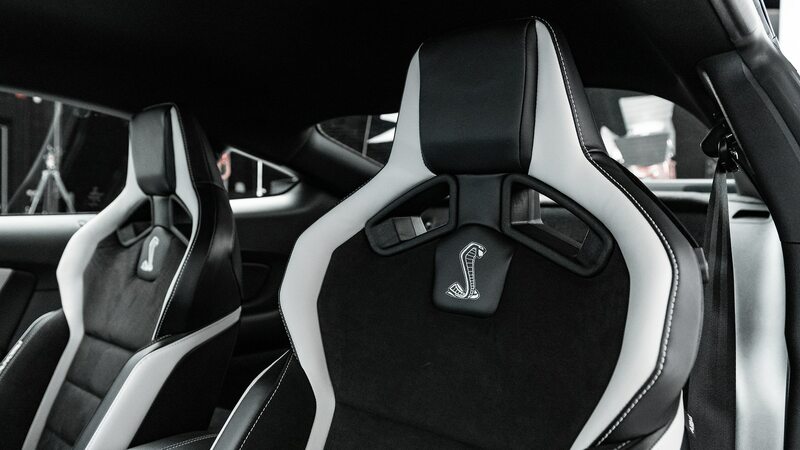 The look is all intent and menace, and the largest snake badge ever slapped on a Shelby informs lesser cars in front of the GT500 to get the hell out of the way. 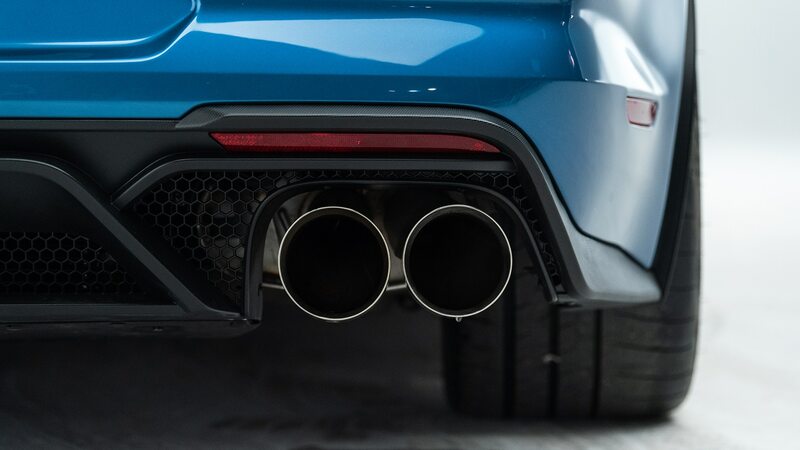 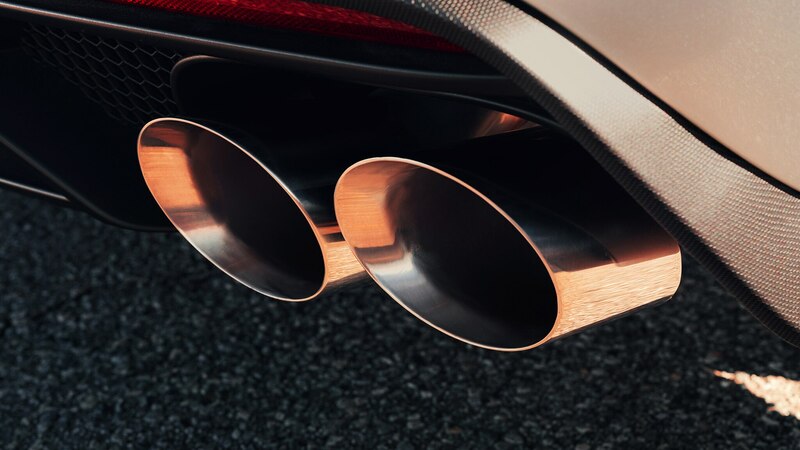 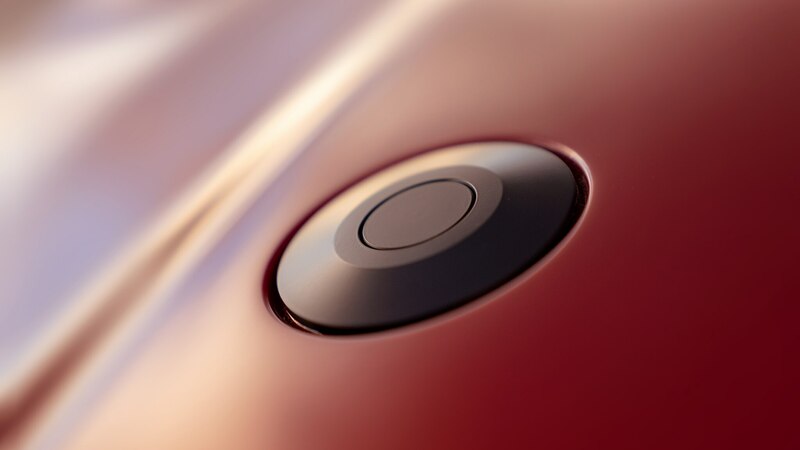 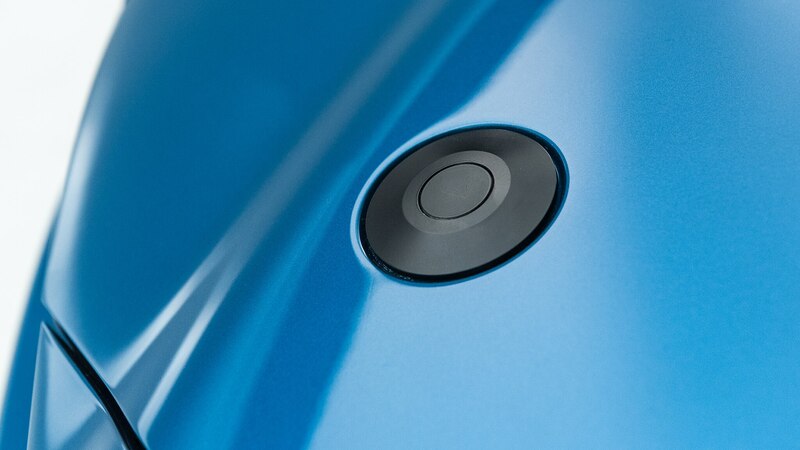 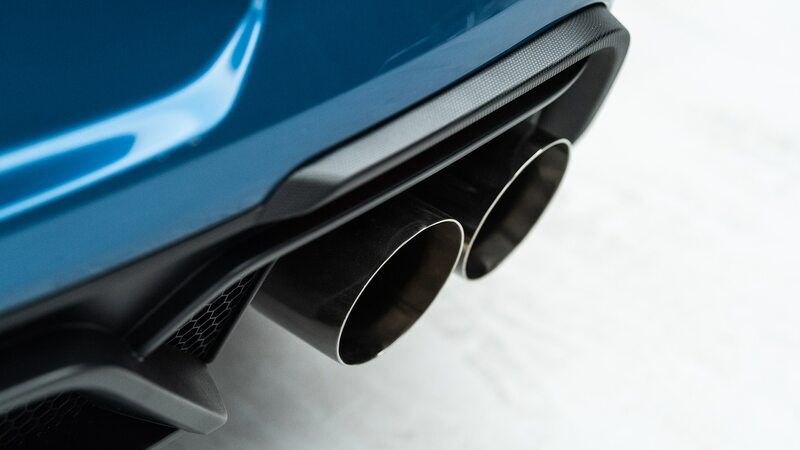 Meanwhile, the quad five-inch exhaust tips will trumpet an eight-cylinder raspberry to those it leaves in the dust. 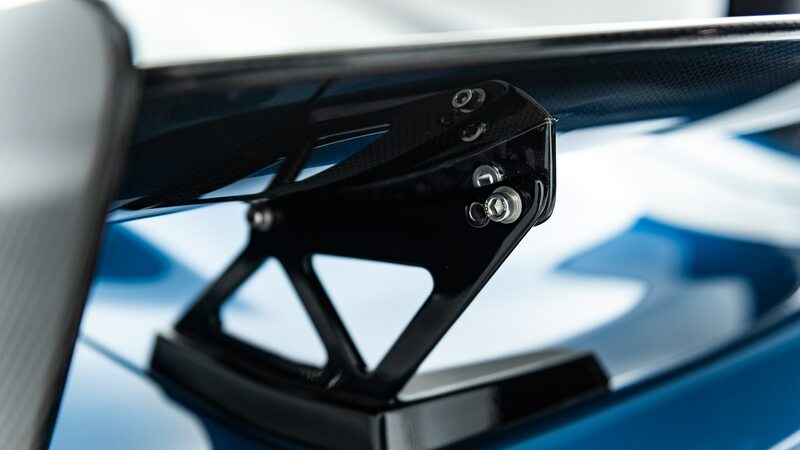 And those messages will resonate not only on the street, but also on a road course, thanks to a newfound focus on handling for what has traditionally been a straight-line thumper. 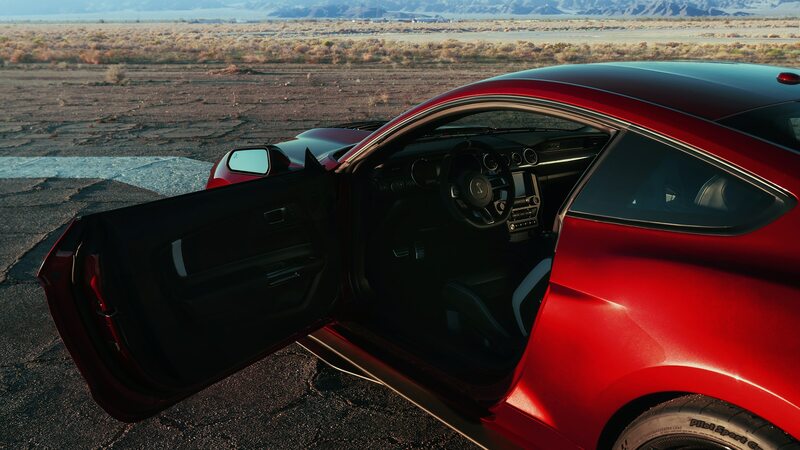 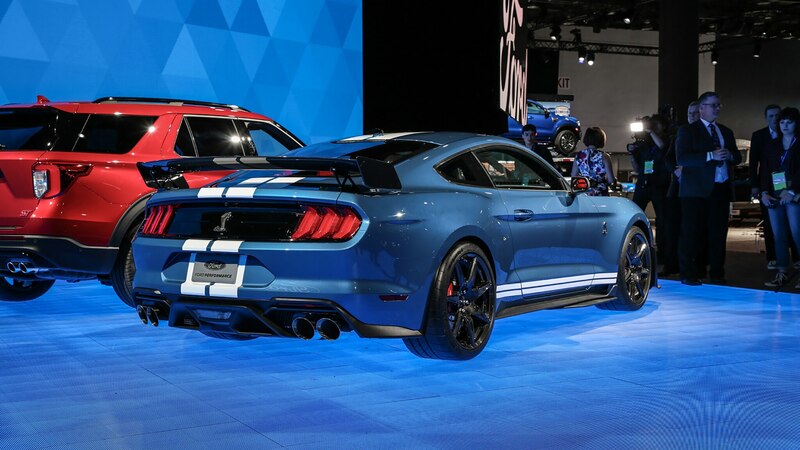 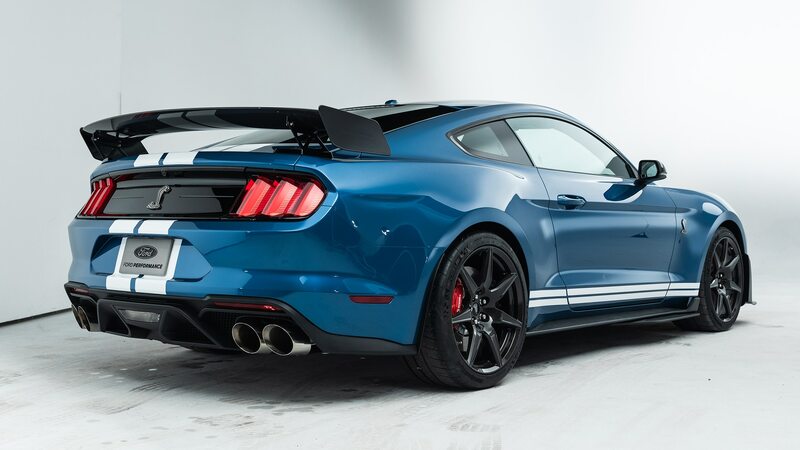 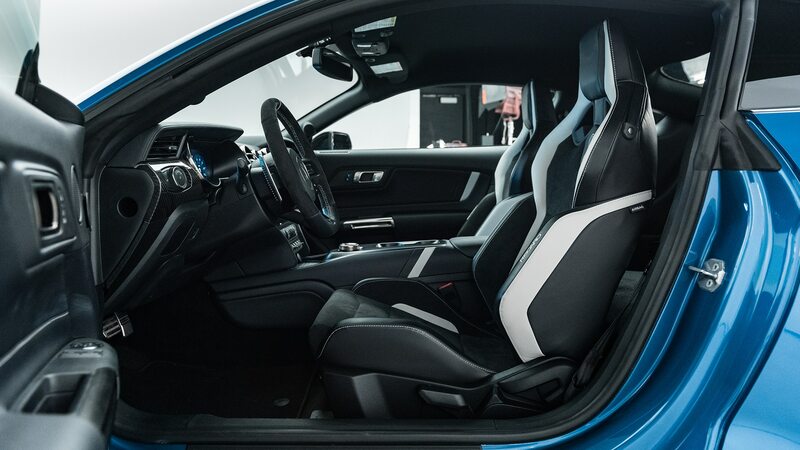 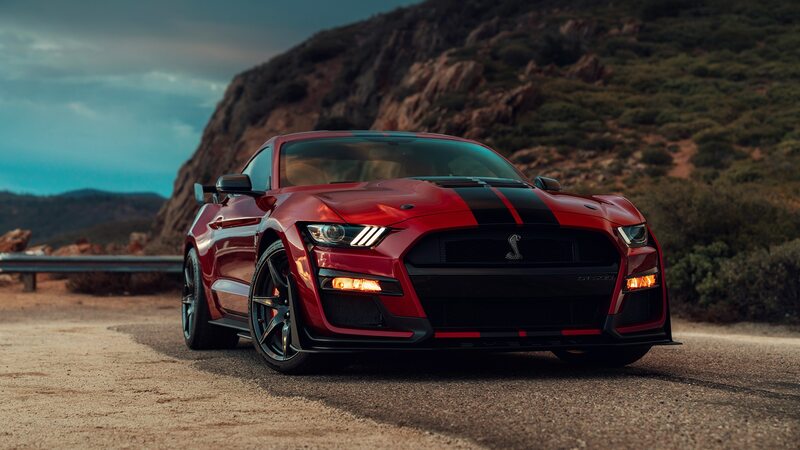 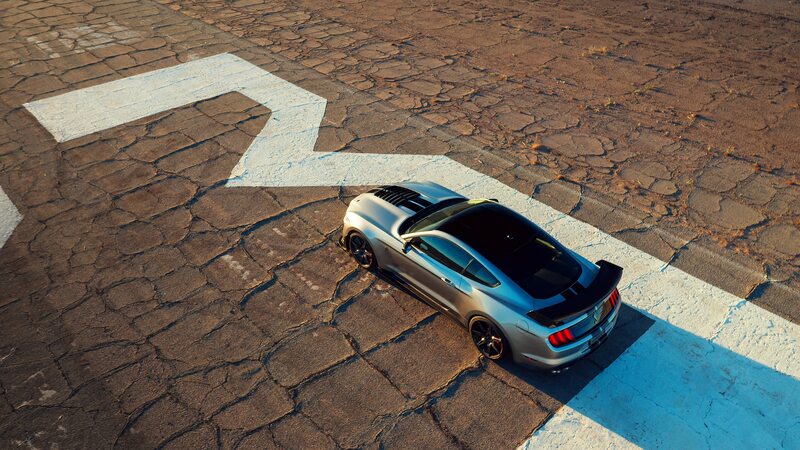 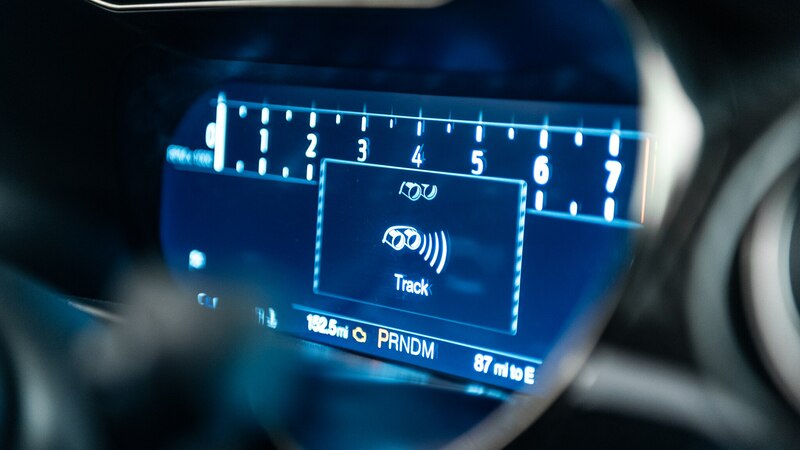 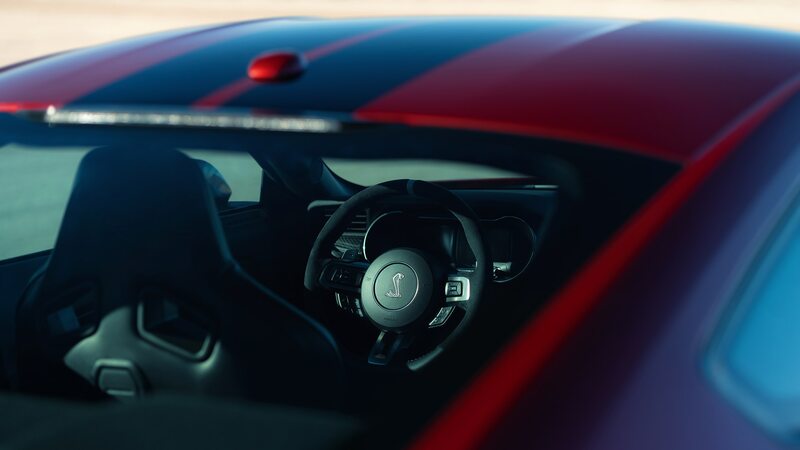 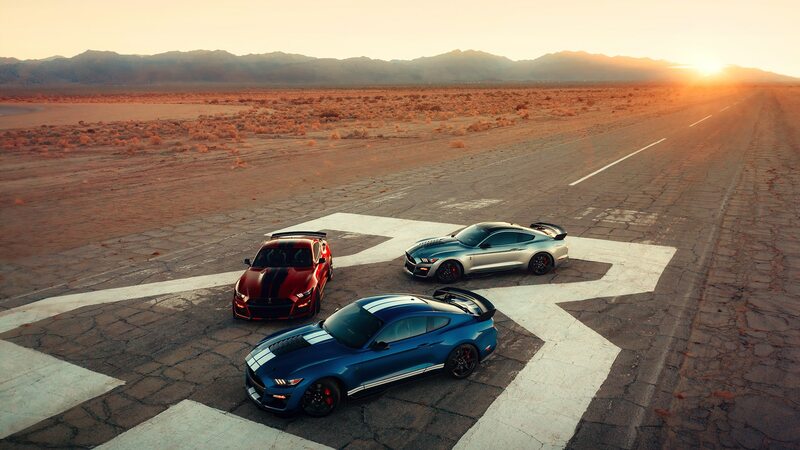 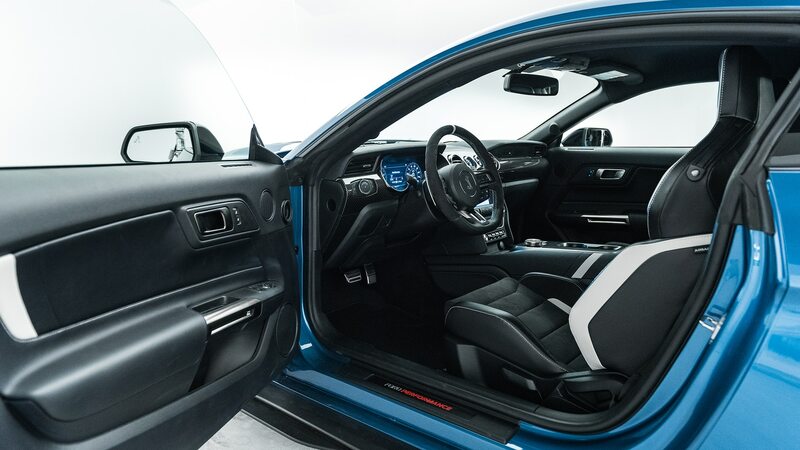 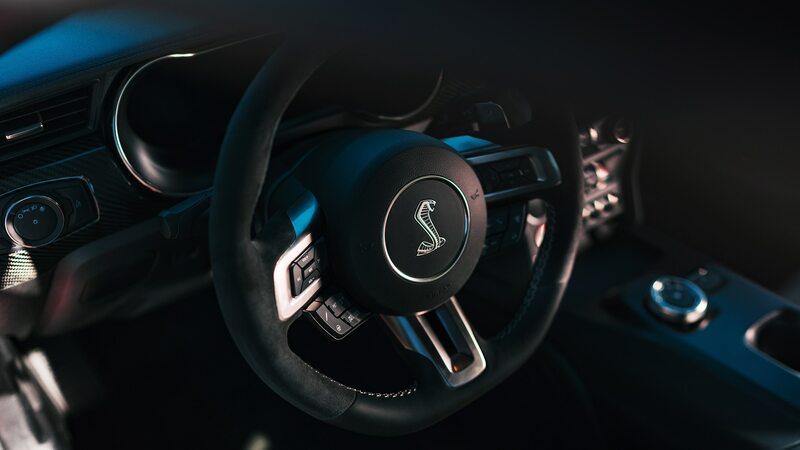 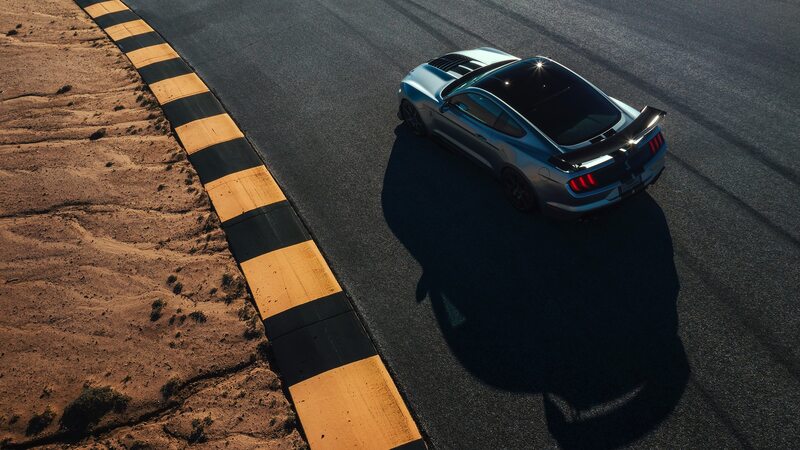 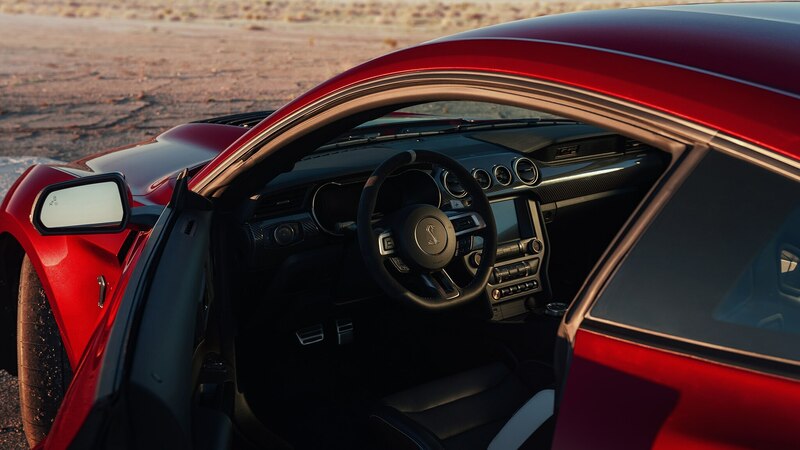 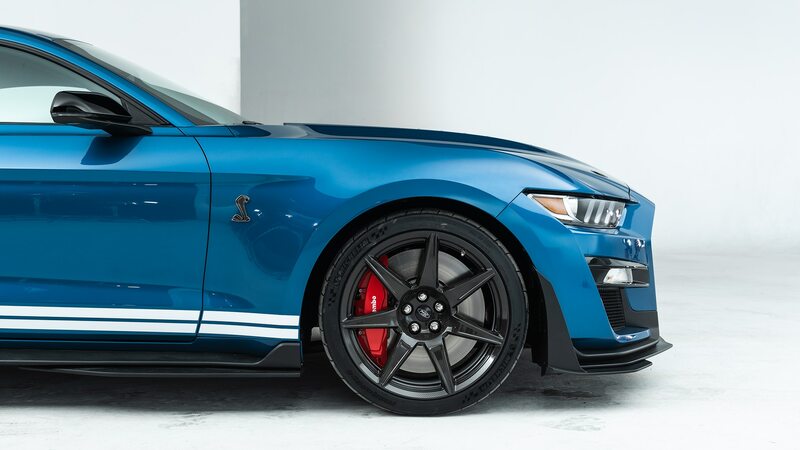 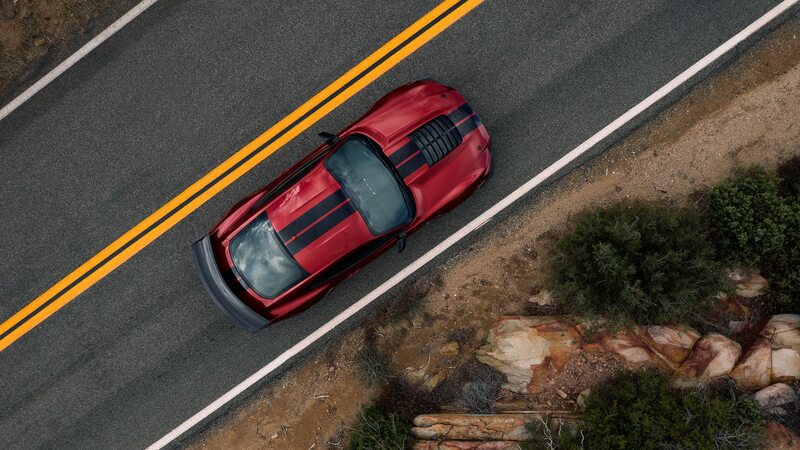 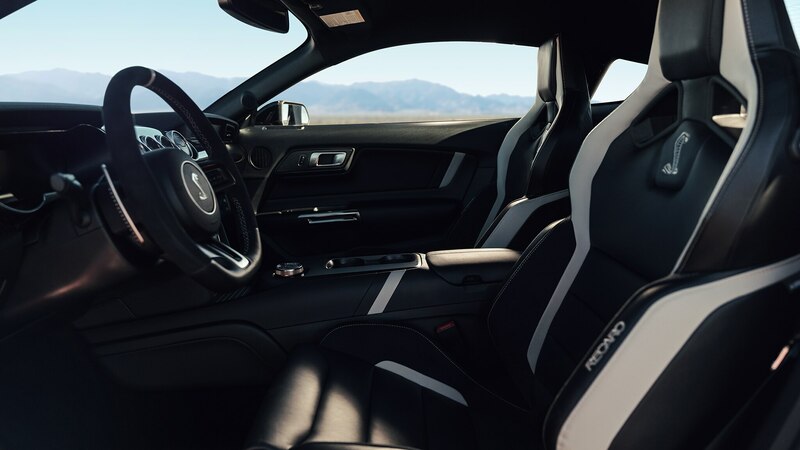 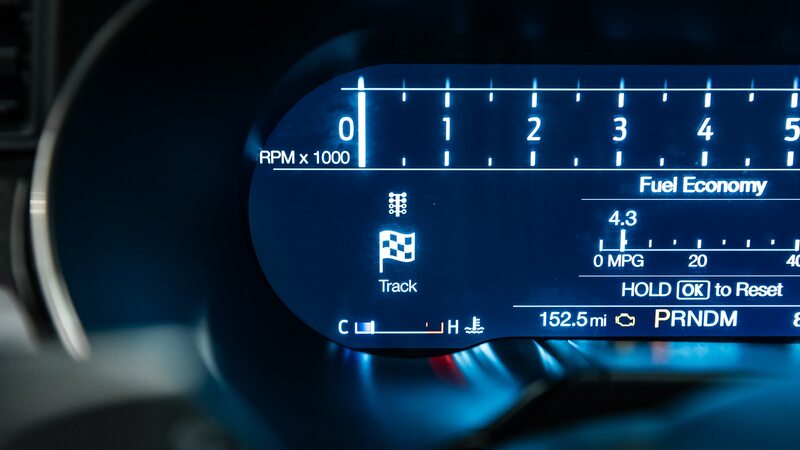 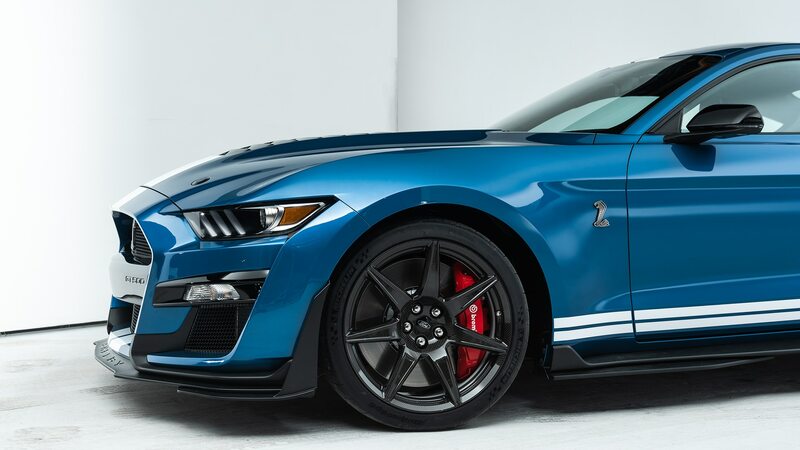 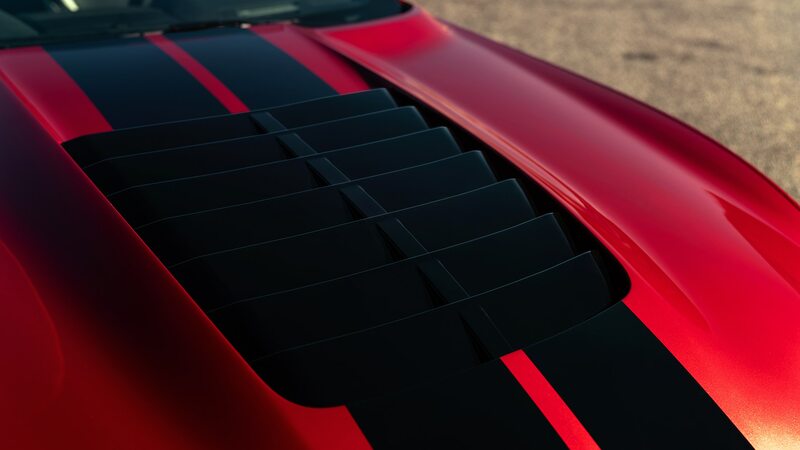 To that end, the 2020 Mustang Shelby GT500’s chassis features magnetorheological dampers, as well as truly massive 16.5-inch front and 14.6-inch rear two-piece brake rotors. 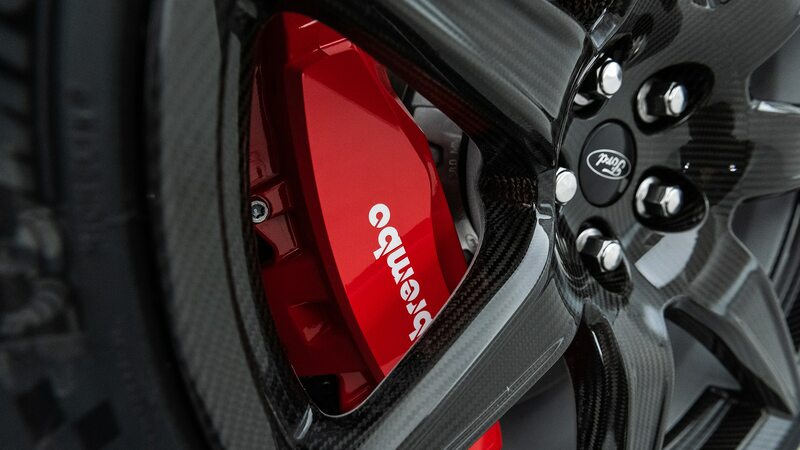 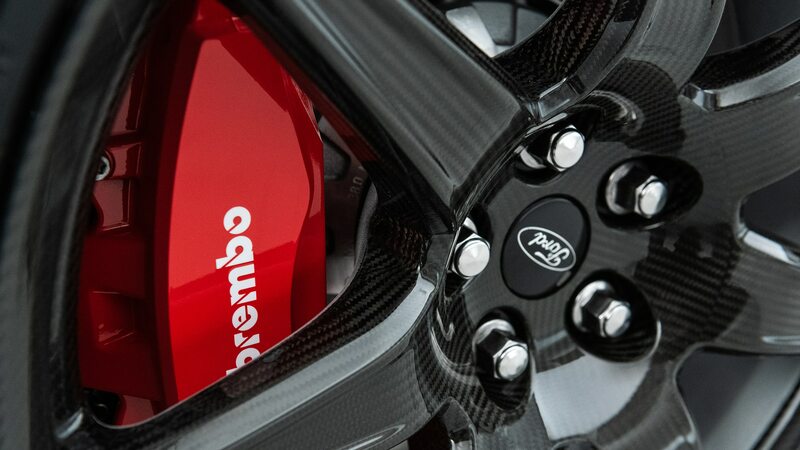 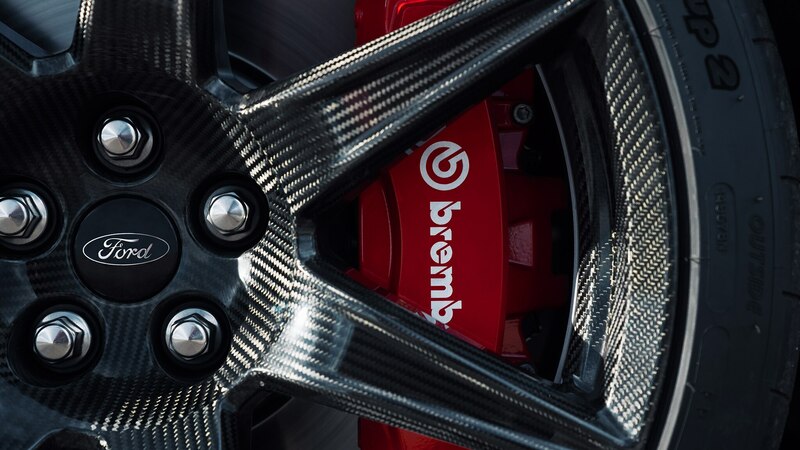 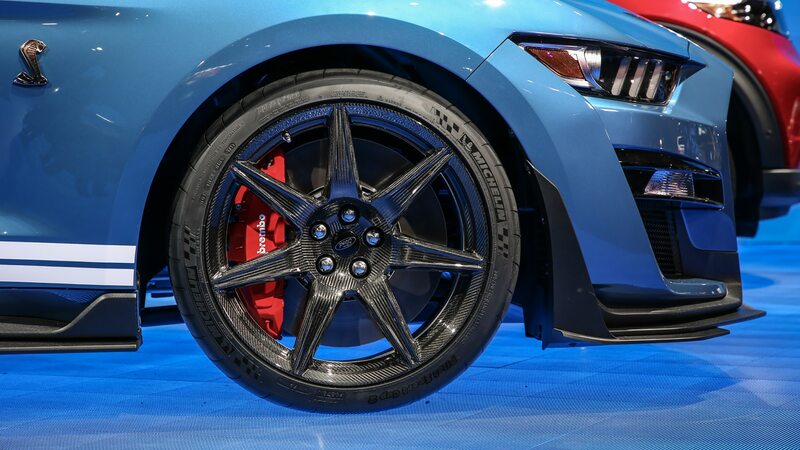 Those discs are pinched by six-piston fixed Brembo calipers up front and four-piston calipers out back, and the fronts feature 20 percent more swept area than little-brother GT350’s. 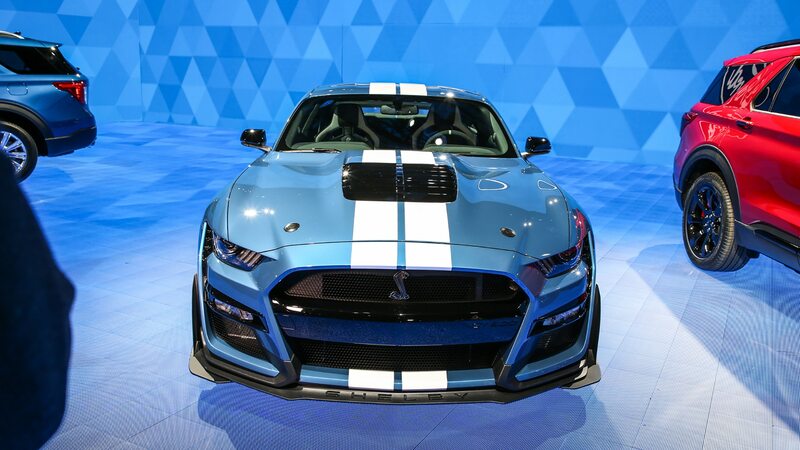 The ride is set up to be more forgiving than the GT350’s. 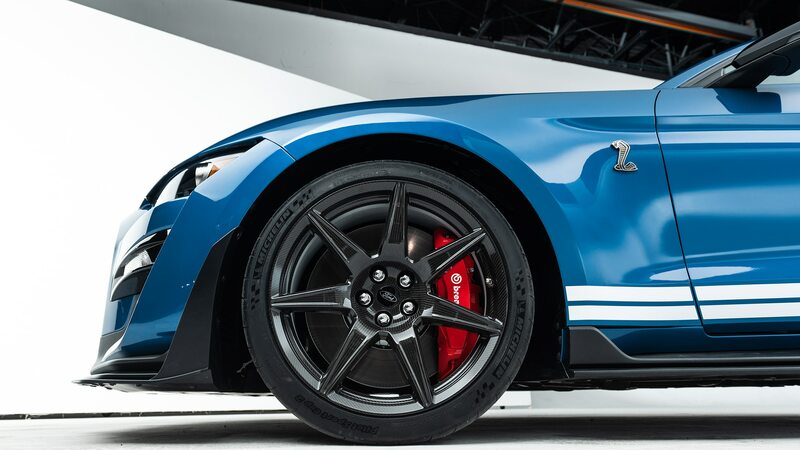 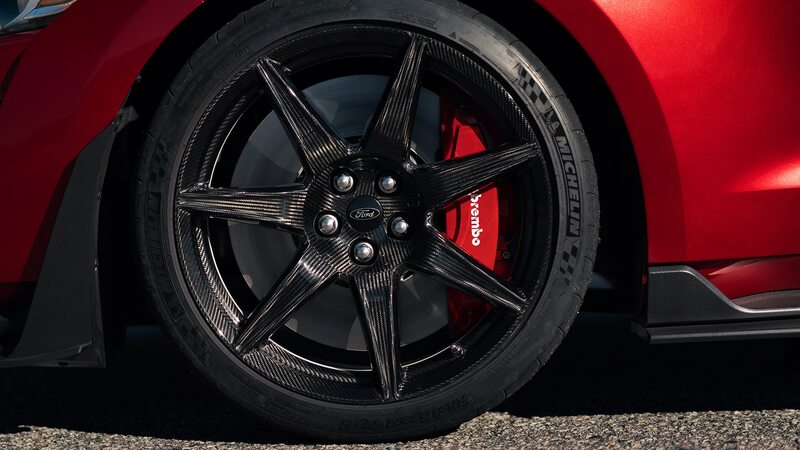 The standard wheels and tires are 20×11-inch aluminum pieces wrapped in Michelin Pilot Sport 4S rubber, while an upgrade package brings Ford GT–style exposed carbon-fiber 20×11.5-inch wheels and Pilot Sport Cup 2s. 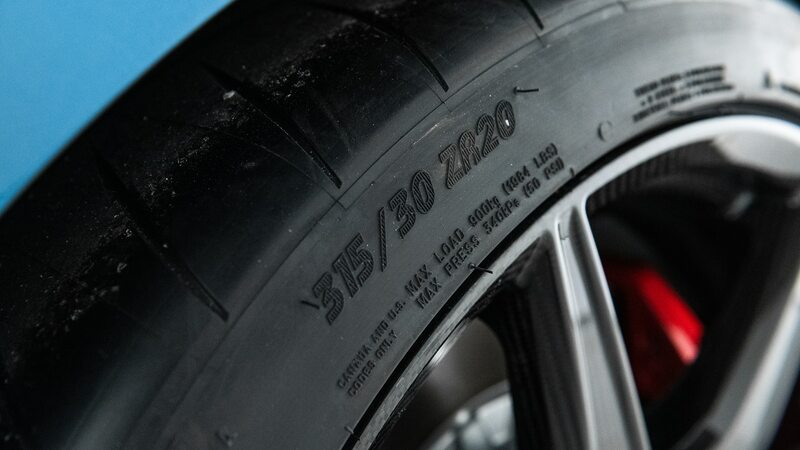 The tires are sized 305/30 front and 315/30 in the back with either wheel. 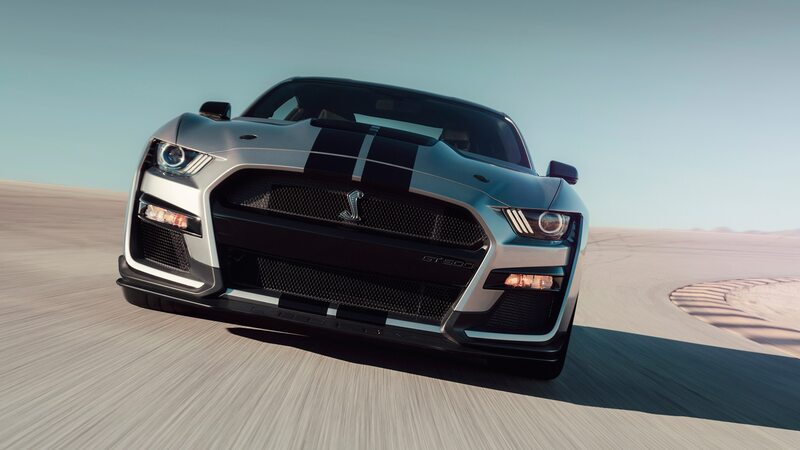 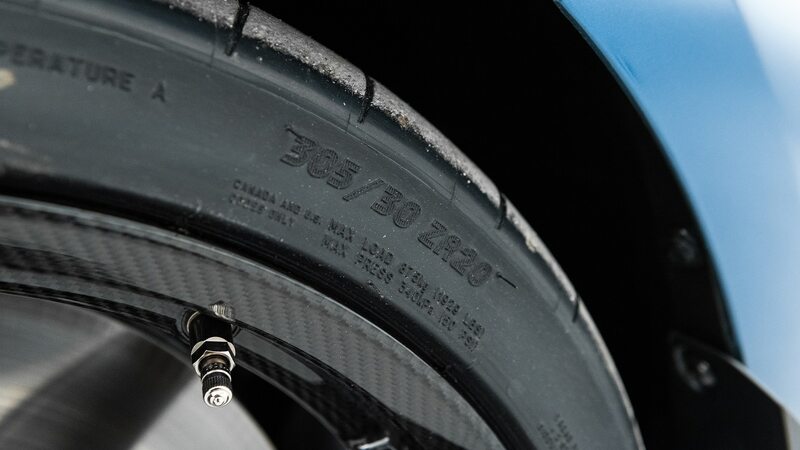 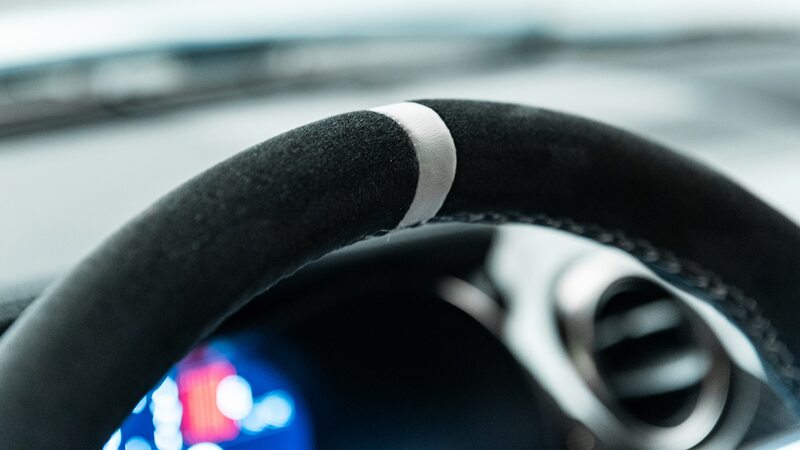 To get the carbon-fiber wheels, you need to spec the Carbon Fiber Track Package (CFTP), which brings a number of goodies intended to help the GT500 circle a track quicker. 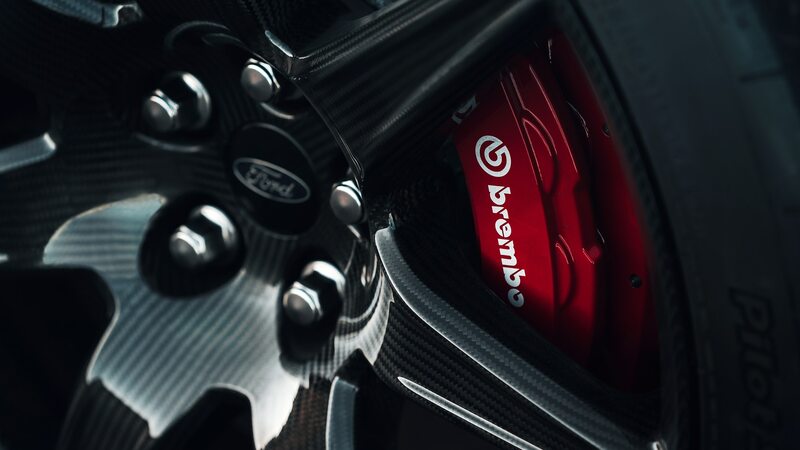 In addition to the wheels—sourced from Carbon Revolution in Australia and created using proprietary technology—and tires, the CFTP bundle also nets adjustable front strut mounts, Recaro front seats, a rear-seat delete, unique springs and anti-roll bars that lower the ride height, wickers and dive planes for the front splitter, and a big ol’ exposed carbon-fiber wing mounted to the trunklid. 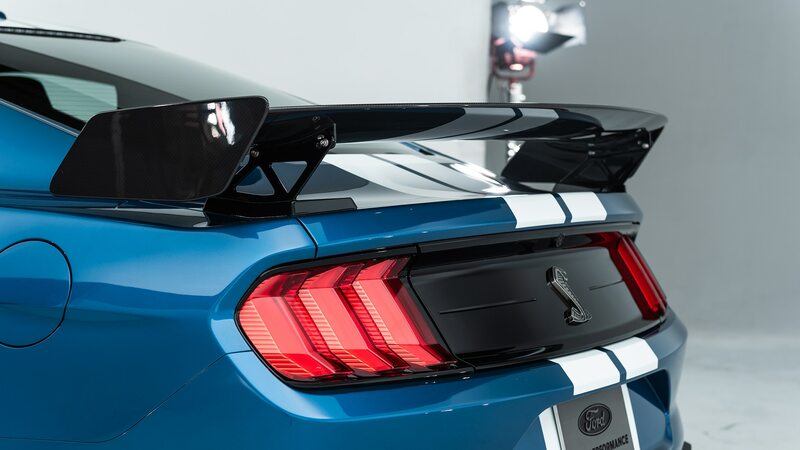 A lesser Handling Package will also be available with the strut mounts and a smaller spoiler with a Gurney flap, but not the other stuff. 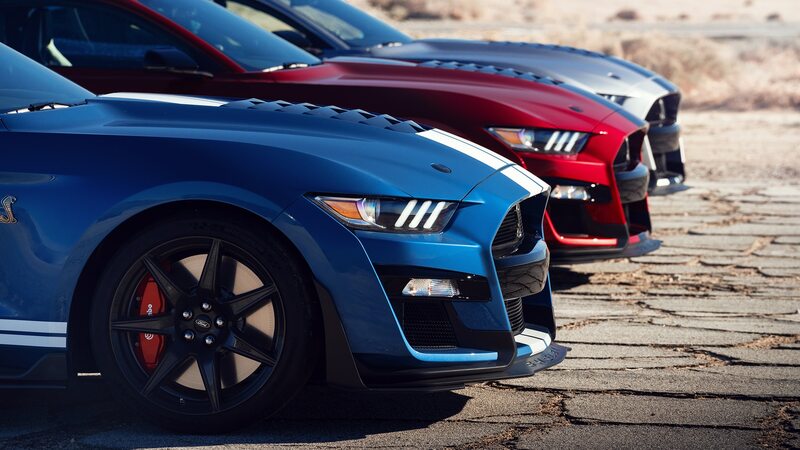 There are eleven colors available, including the new Red Hot, Iconic Silver, and Twister Orange. 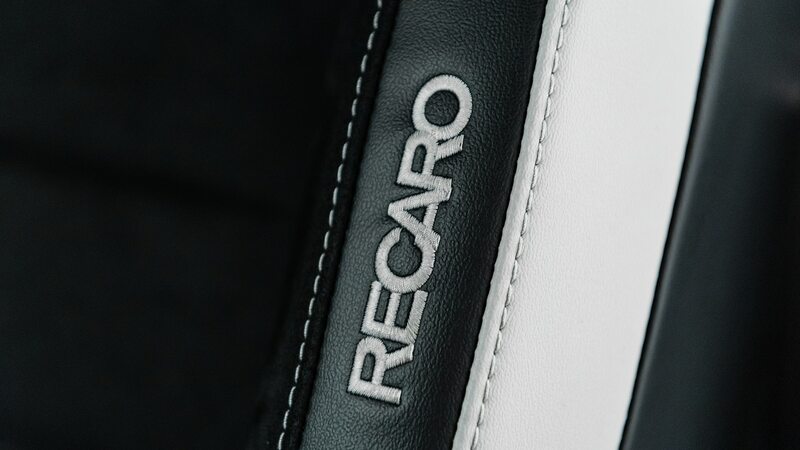 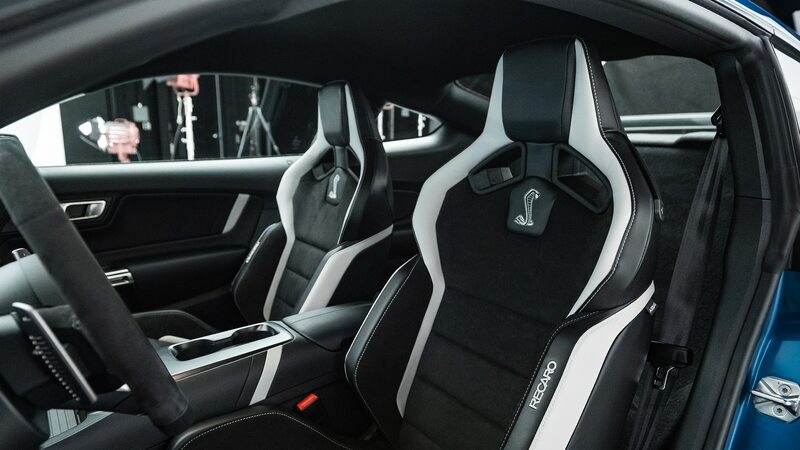 Stripes are of course on the options list, as are the Recaro seats, a painted roof, and carbon-fiber interior trim. 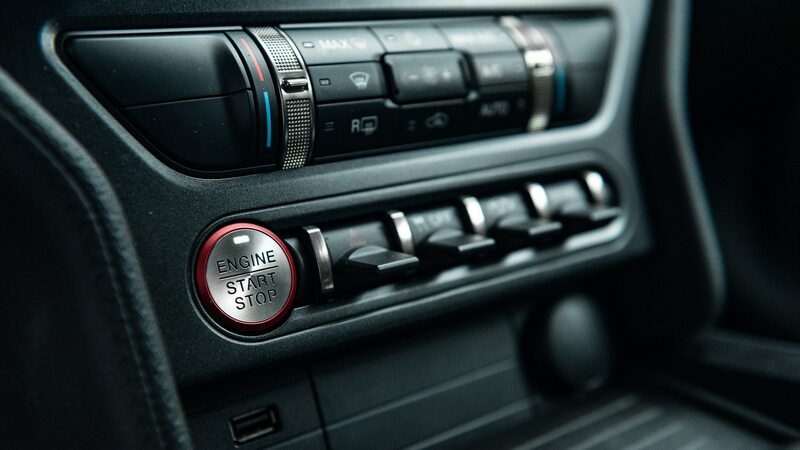 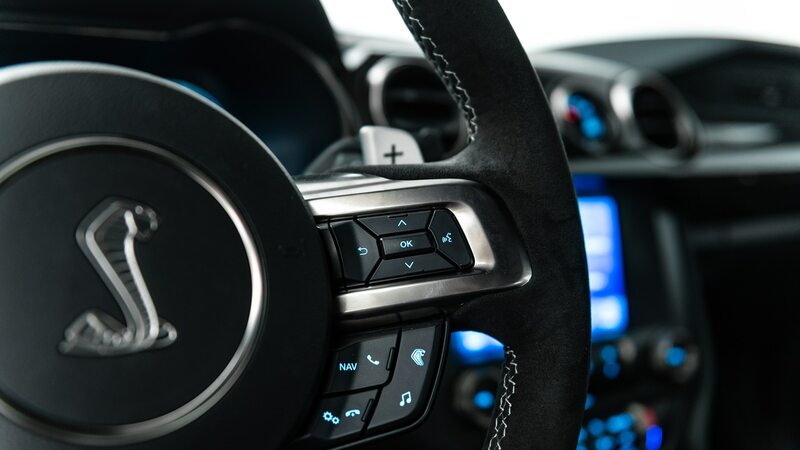 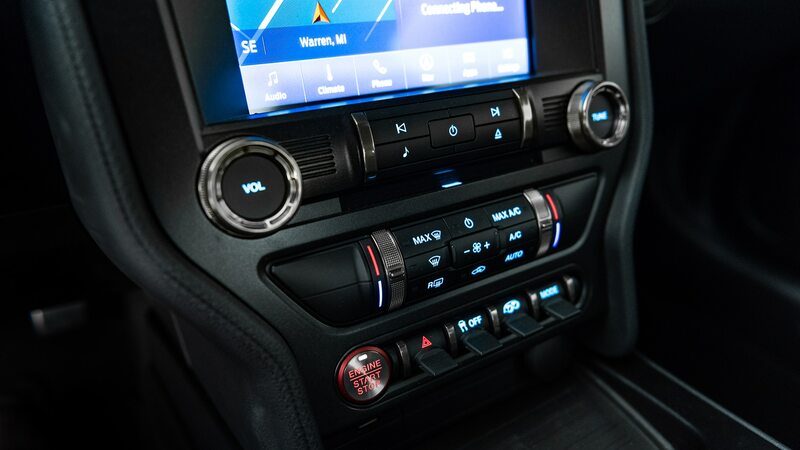 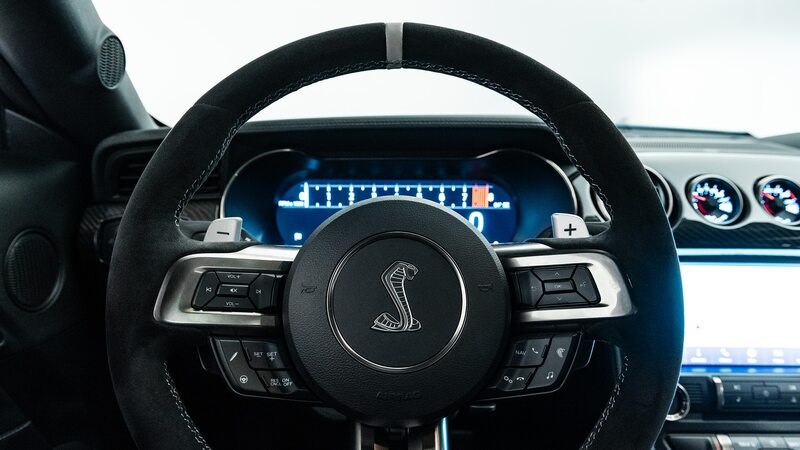 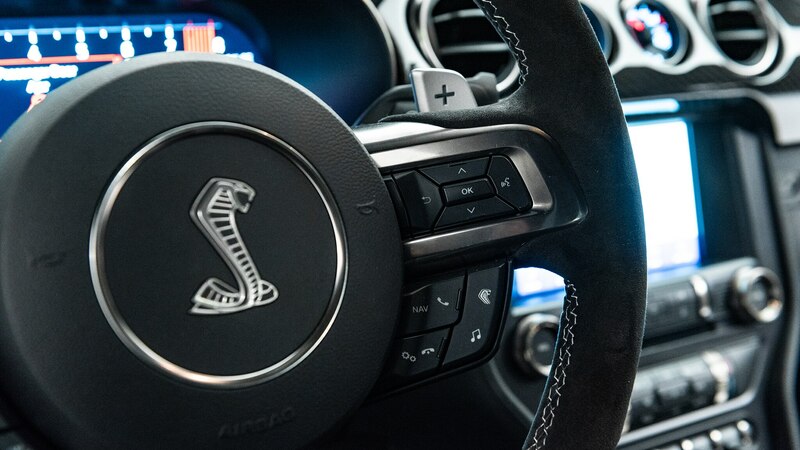 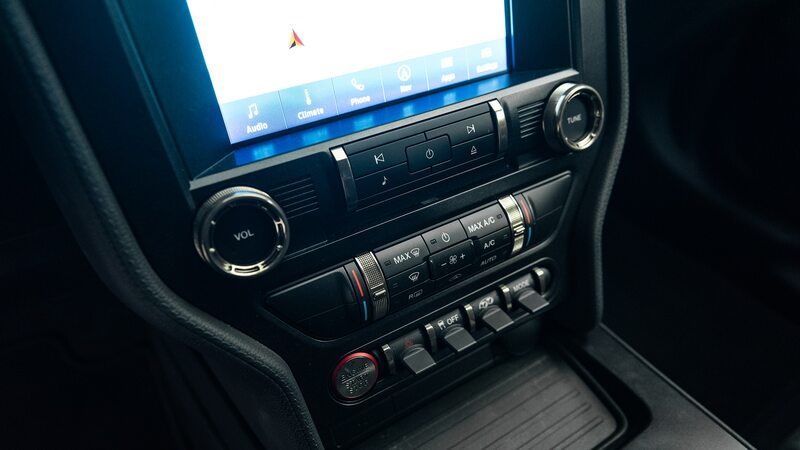 The shift paddles are unique to this car, and are inspired by those in the Raptor pickup. 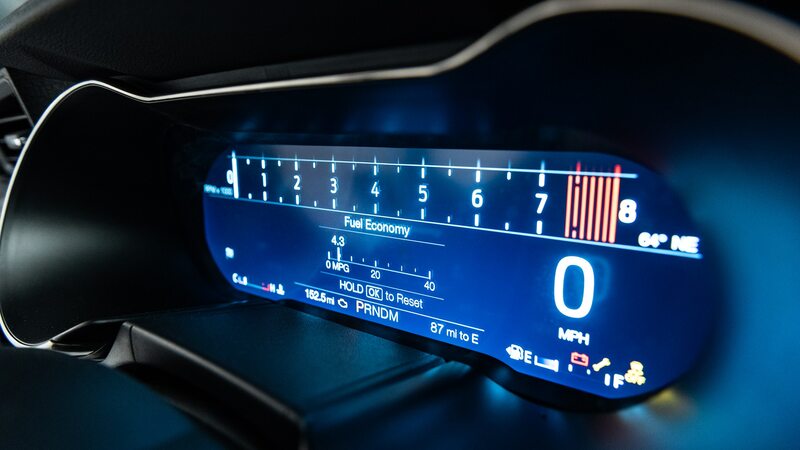 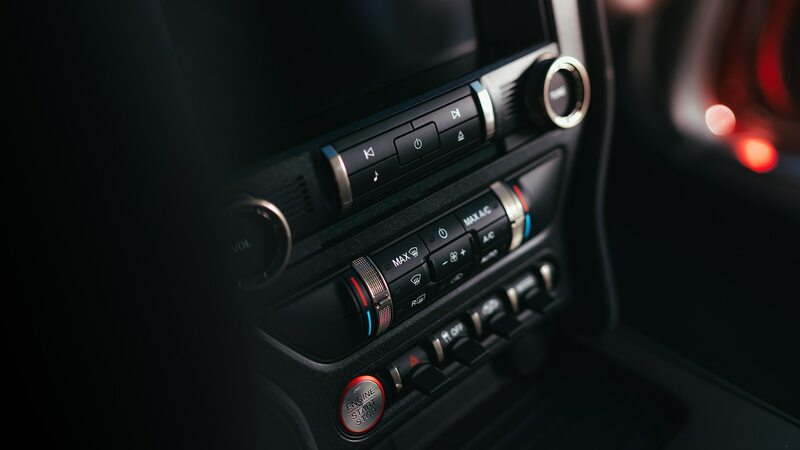 Additional add-ons include 12-speaker B&O audio, a 12.0-inch digital instrument cluster, and microfiber accents for the cabin. 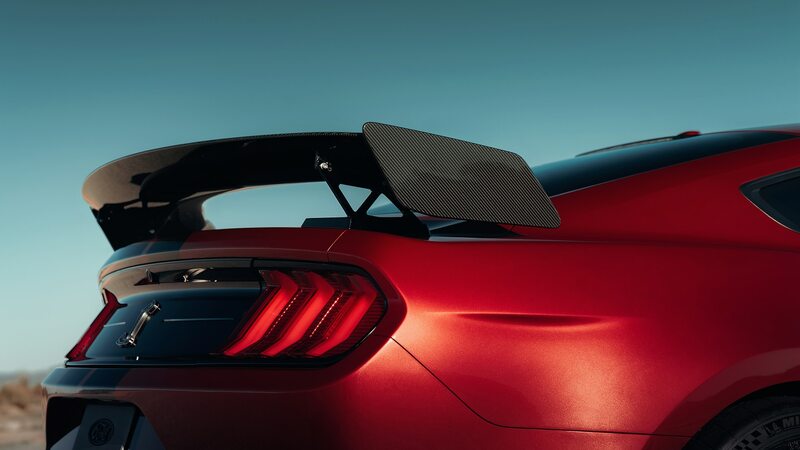 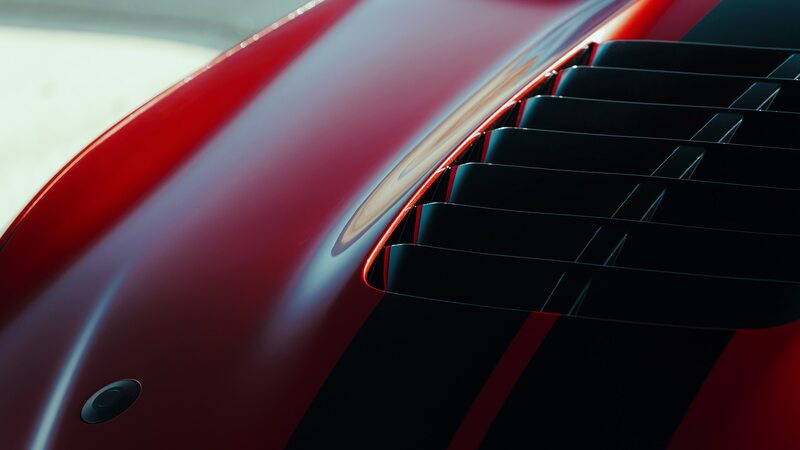 The car will not be available in Europe for several reasons, including a lack of pedestrian-protection clearance under the hood, the fact that the big wing doesn’t meet radius-edge requirements there, and the need to fit a gasoline particulate filter that would get blown apart anyway. 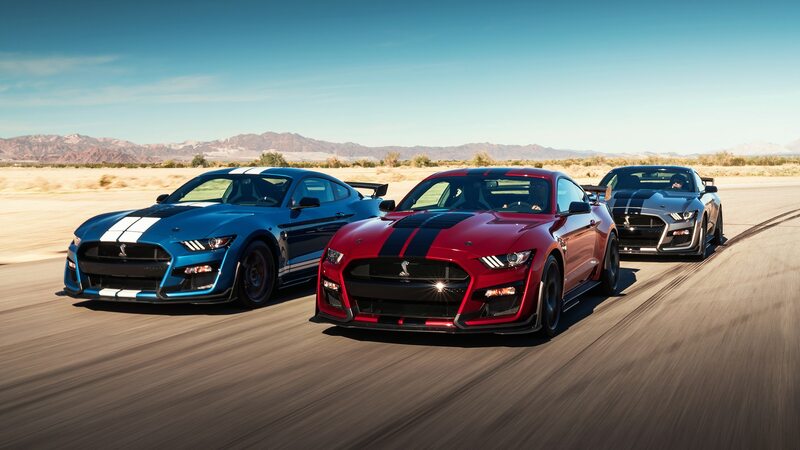 It’s been 50 years or so since the GT350 and GT500 shared a showroom floor during a period many consider the golden age of the Mustang. 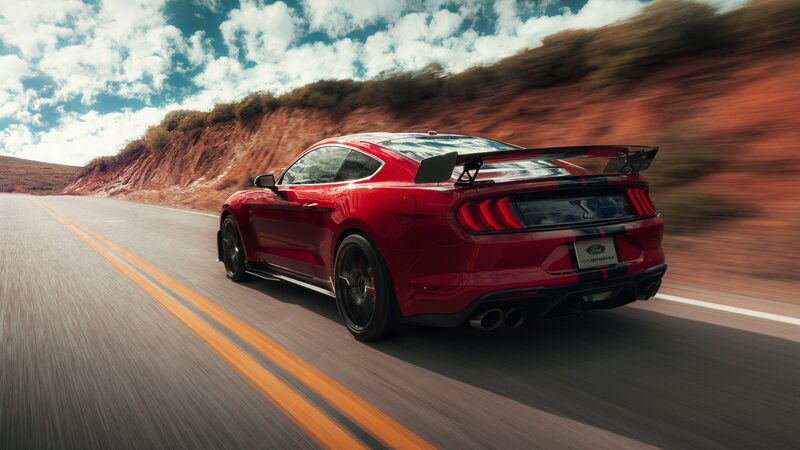 But there’s an argument to be made that Mustang fans have never had it better than today, with a base model that makes more than 300 horsepower, a 460-hp GT, the 480-hp Bullitt, the 526-hp GT350, and this new 700-plus-hp GT500 all on offer. 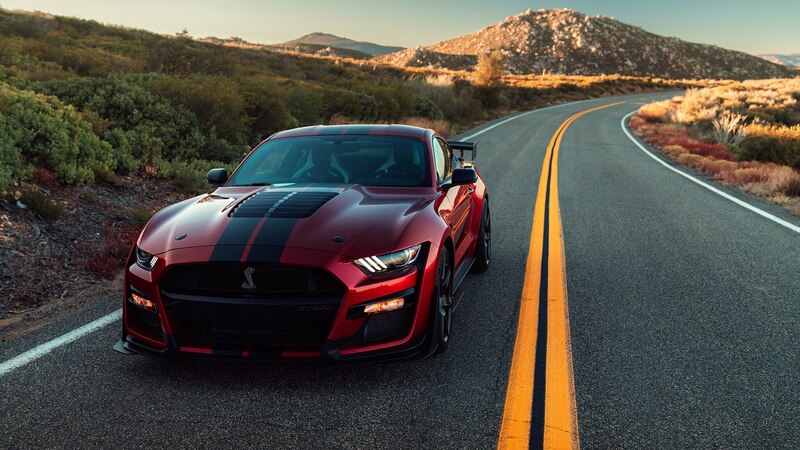 Heck, muscle-car fans in general have it pretty good now, considering that 700- and 800-hp Dodges and broad, rewarding Camaro lineup are also roaming American streets. 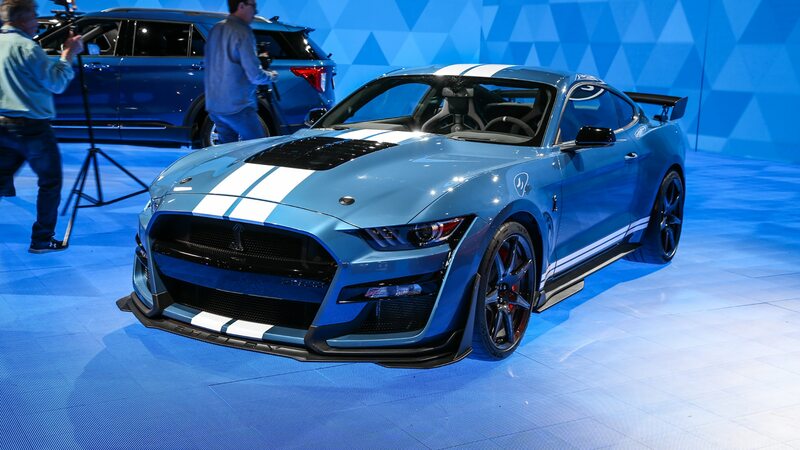 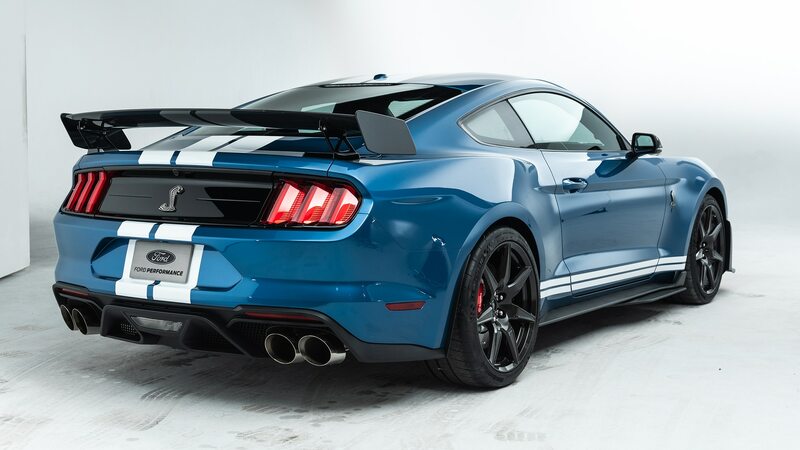 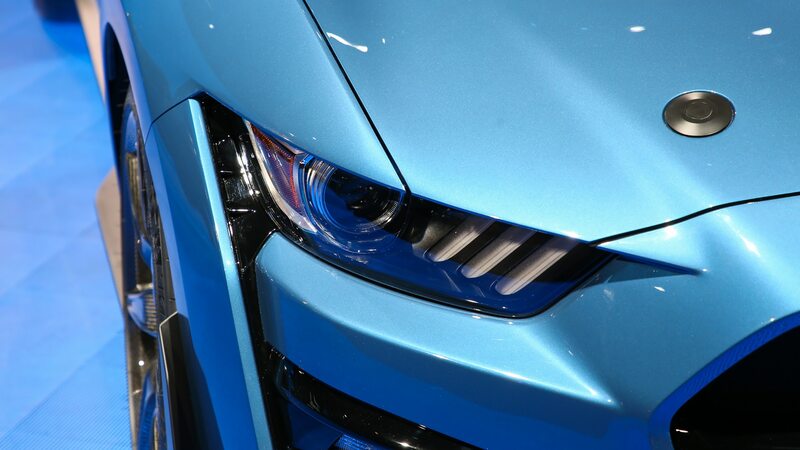 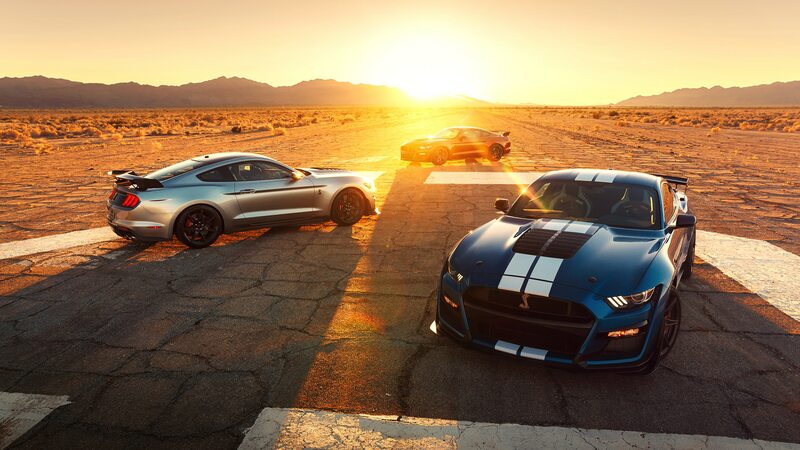 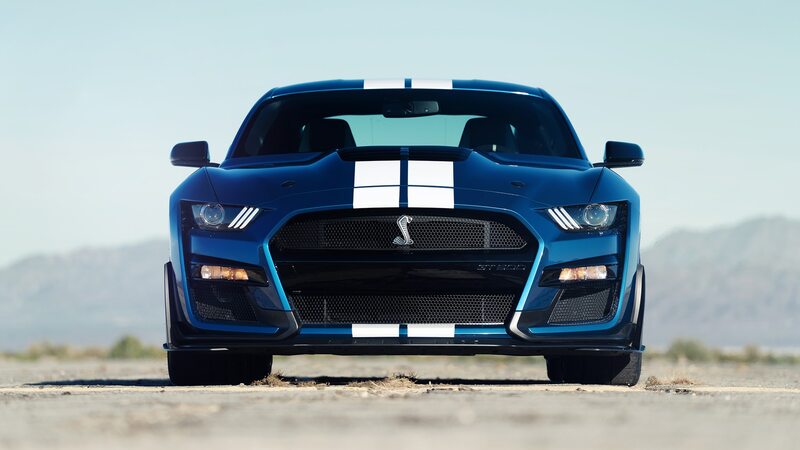 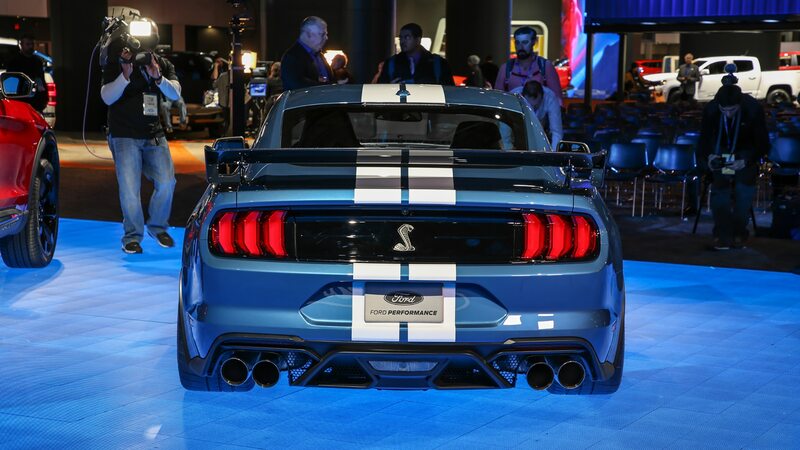 But for Blue Oval devotees, there’s nothing like a Shelby, and there’s never been a Shelby like the new GT500. 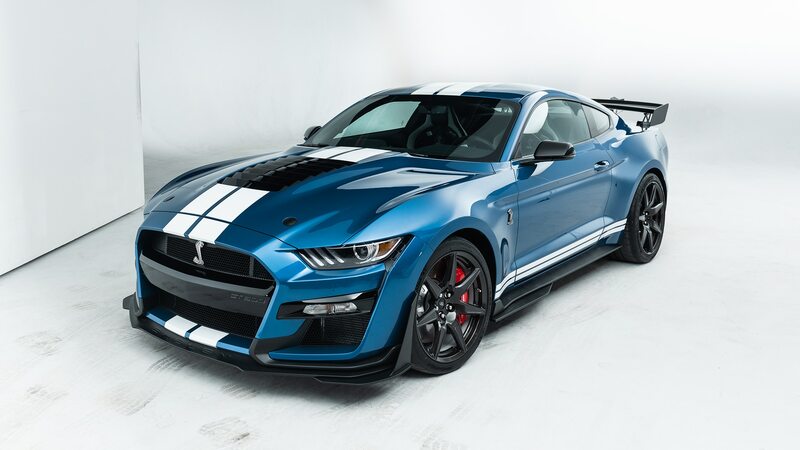 Auctioned off at Barrett-Jackson Scottsdale for a worthy cause.